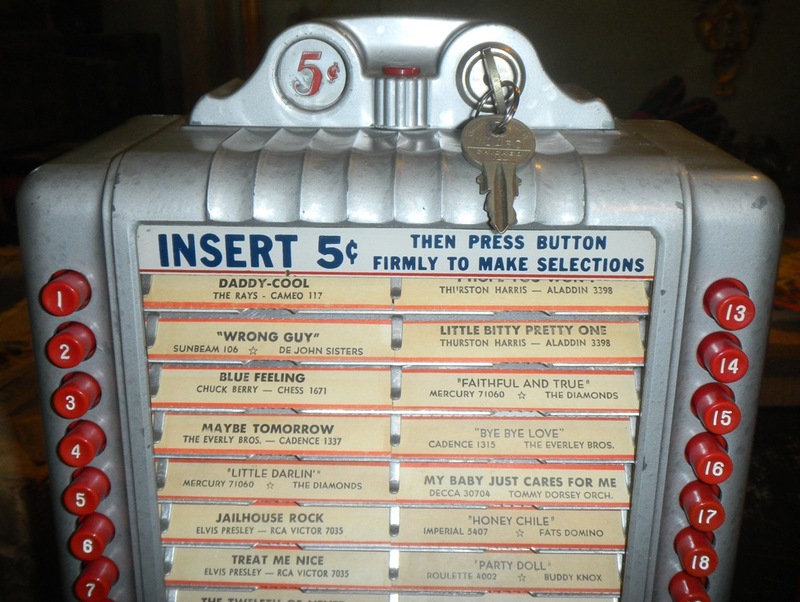 You older jukebox folks likely know me. I lived in San Diego and was active in jukes from 1977 through 1988, especially remote control items. 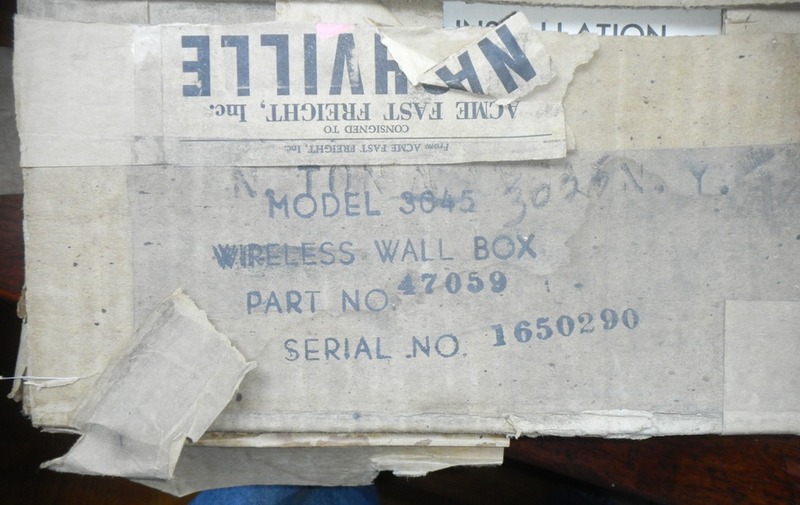 In May of 1979, I bought seven boxed, NOS 3045 wall boxes from Ed Jones for $35 apiece. At one time I owned the Antique Jukebox Company's building in Los Angeles. Tom C would save remote stuff for me. In March of 1980, he turned up a stack of four nice 212 frog master units. In May of 1980, I traveled to Carrizozo, New Mexico, to see the remains of Jack Harkey's hoard. 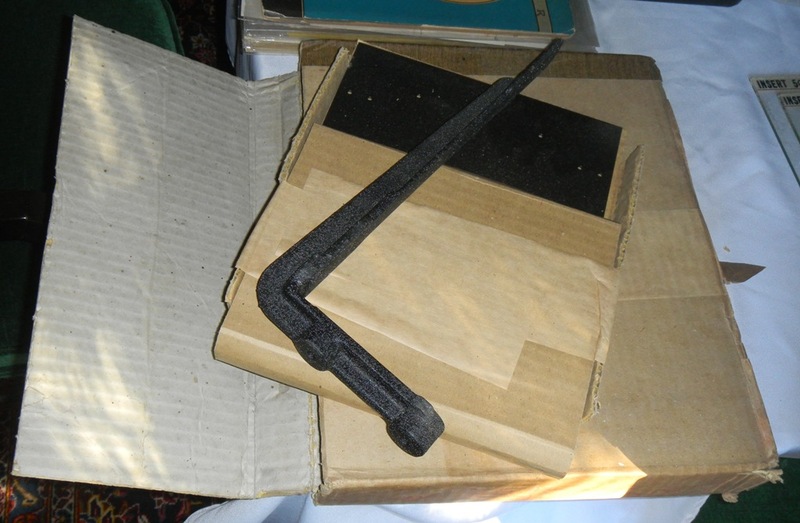 The heat hadn't done the pre-war Catalin plastic items any good. 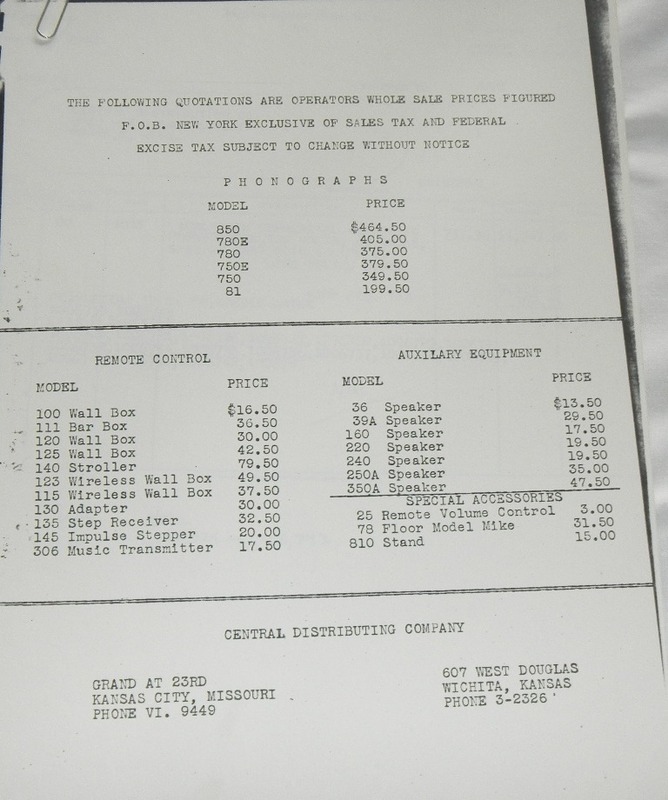 I can recount this history and dates as I was computerized early on. 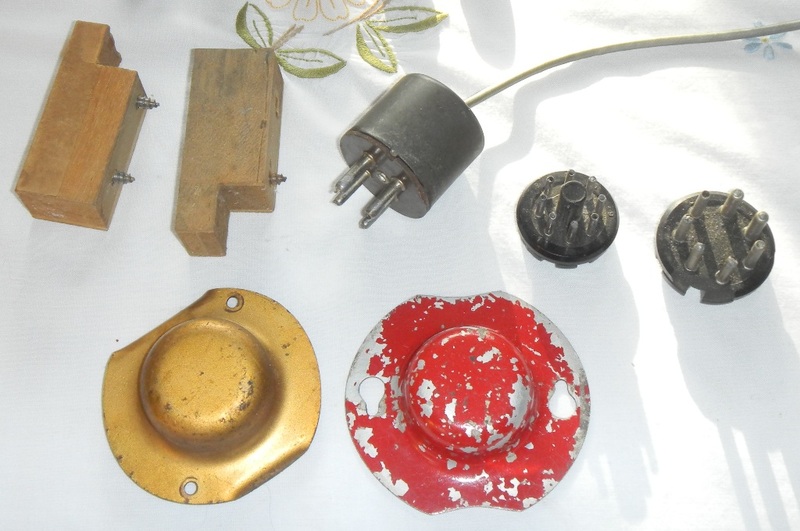 Over the years, I sold the pre-war items and the frog equipment, but I kept the best of each of the 1015 accessories. In the descriptions below I will note how many of each item I've owned. 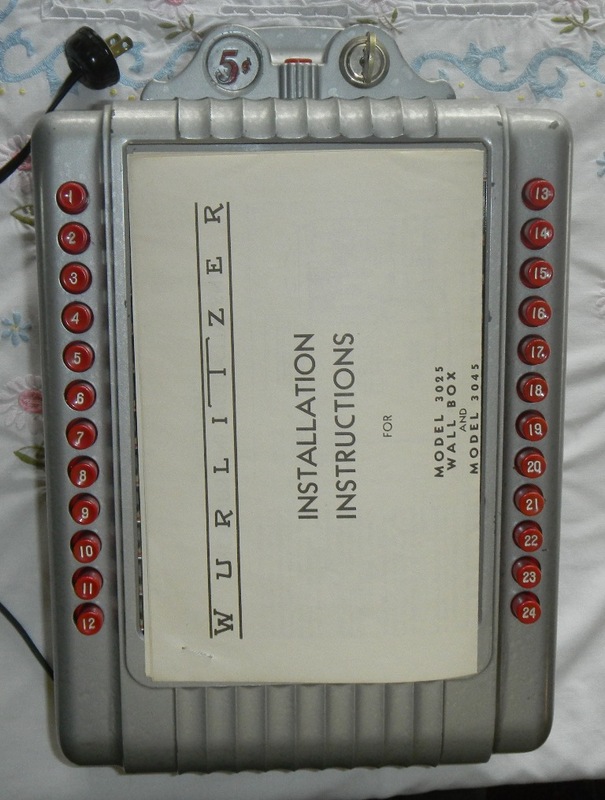 I started the Wurlitzer serial number project back in the late 1970's and see that it is still carried on in Germany. 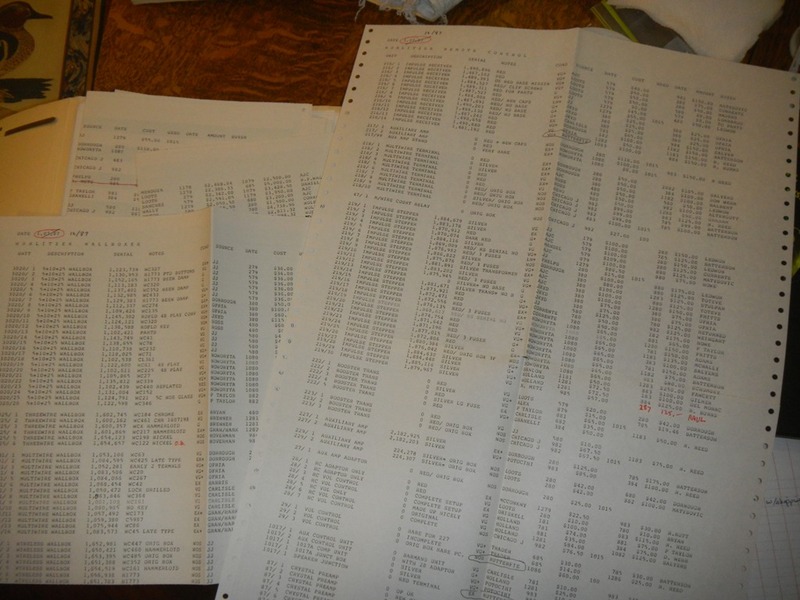 A photo of some my printouts is way below. I bought a large, fixer-upper home seven years ago, and now realize that I'll never hook this stuff up. I'd like to sell everything shown on this page in one lot. I have no idea what it's worth so I would like folks to add it all up and send me an offer. I still haven't found one box that likely contains the original cartons for the 3045, 215, 217 and 219. When it turns up, I'll send it along. 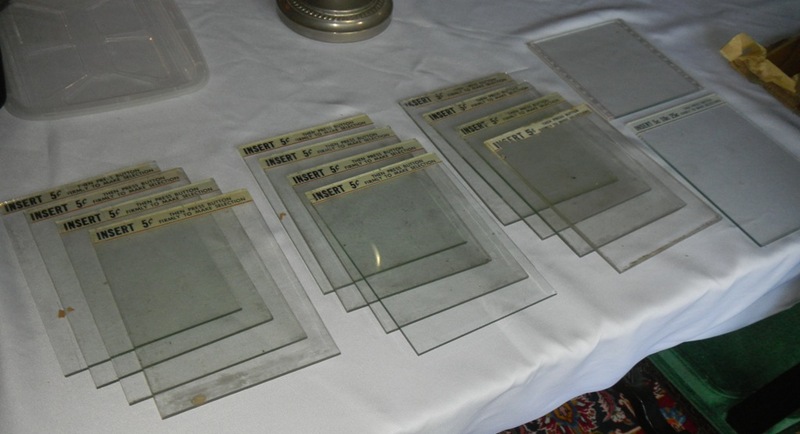 Note: The photos are not in the same order as the table shown below. 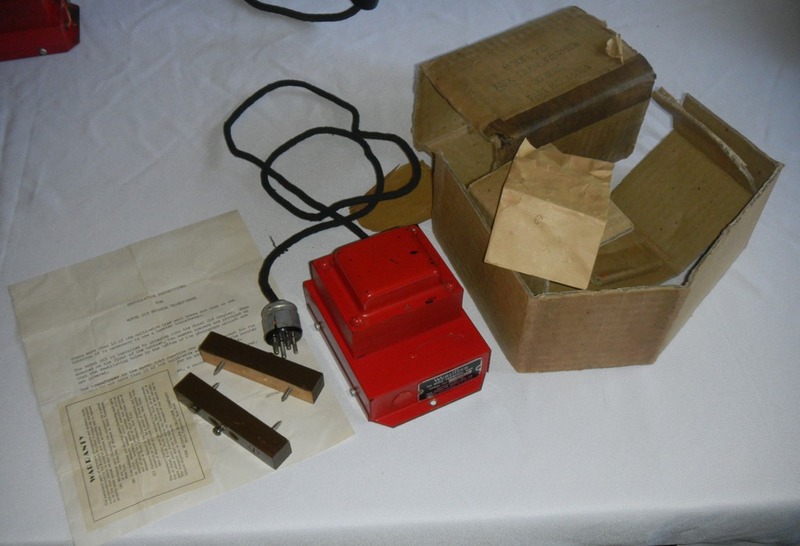 Model Description Serial Condition Keys/Notes Box? 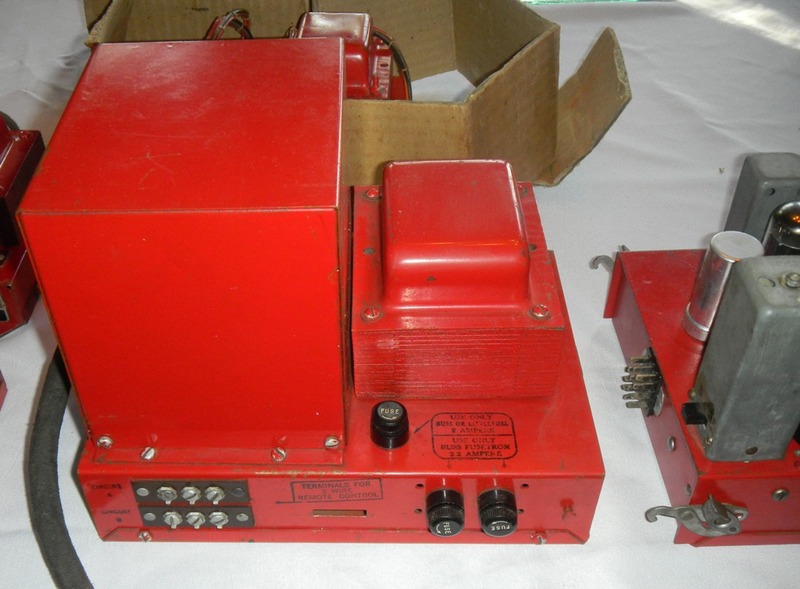 215 Radio Impulse Transmitter with Red Crystal 1,434,556 NOS ?? 219 Impulse Stepper 1,876,982 EXC+ ?? 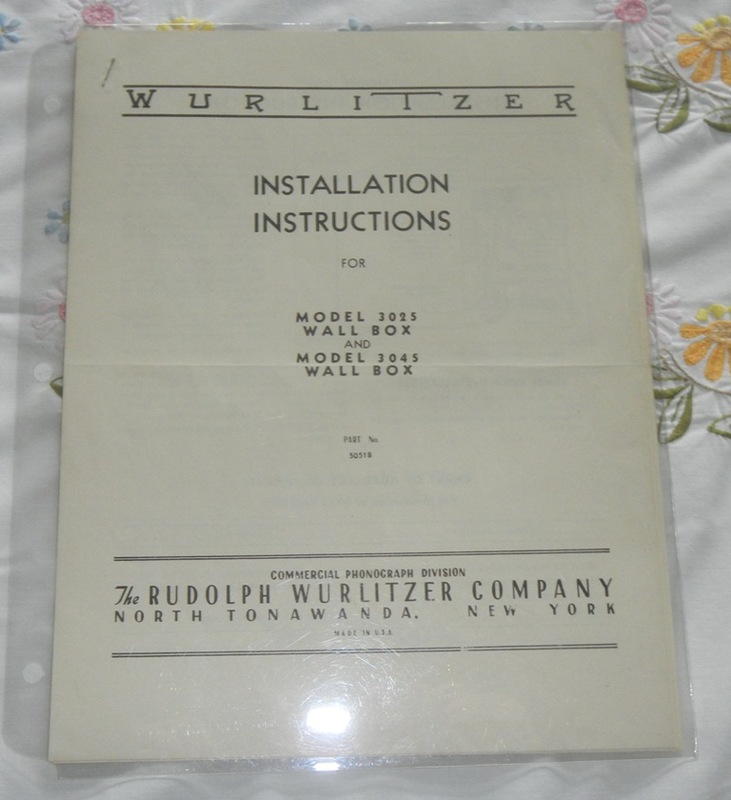 3045 Wall Box for Wireless installation only 1,650,421 NOS- Two WC 460 ?? 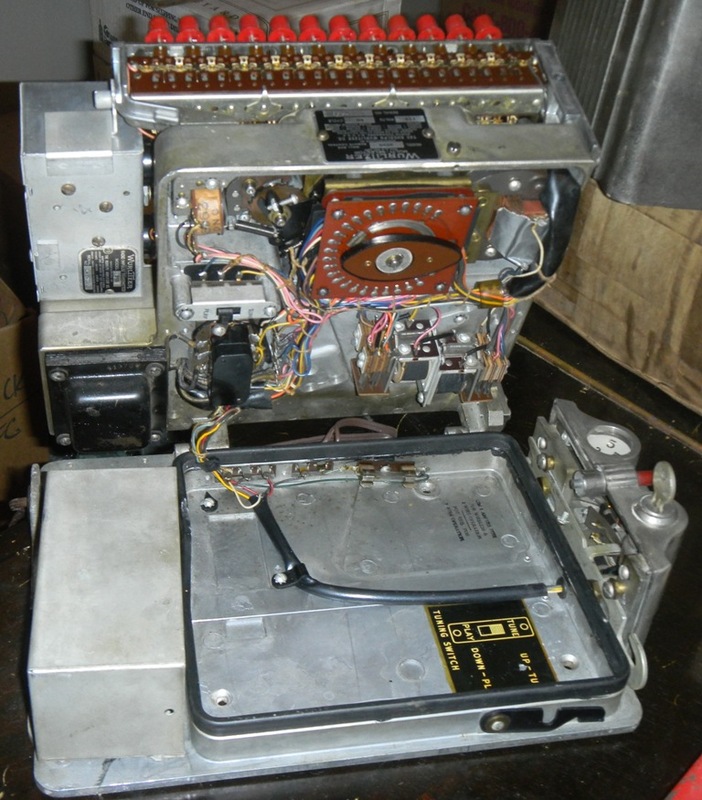 * This serial is for a 3045. 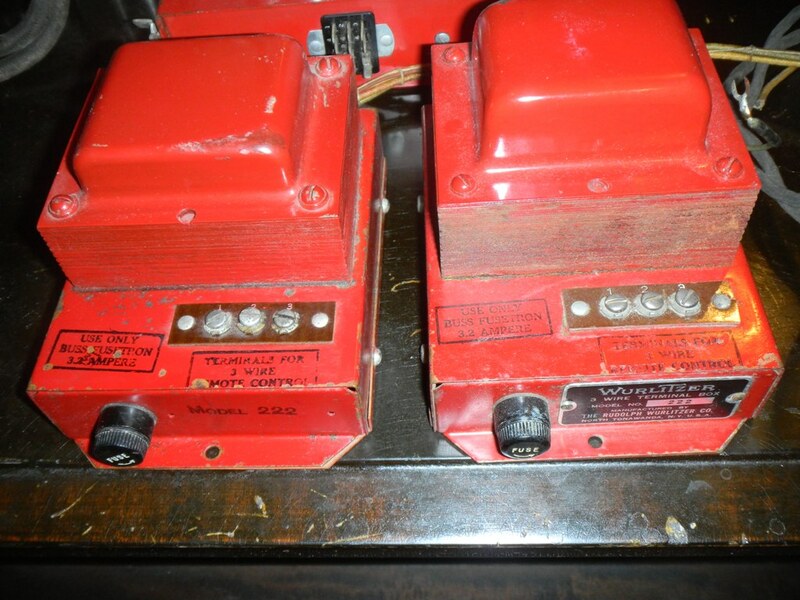 Having a surplus, Wurlitzer converted unpopular 3045's to 3025's. 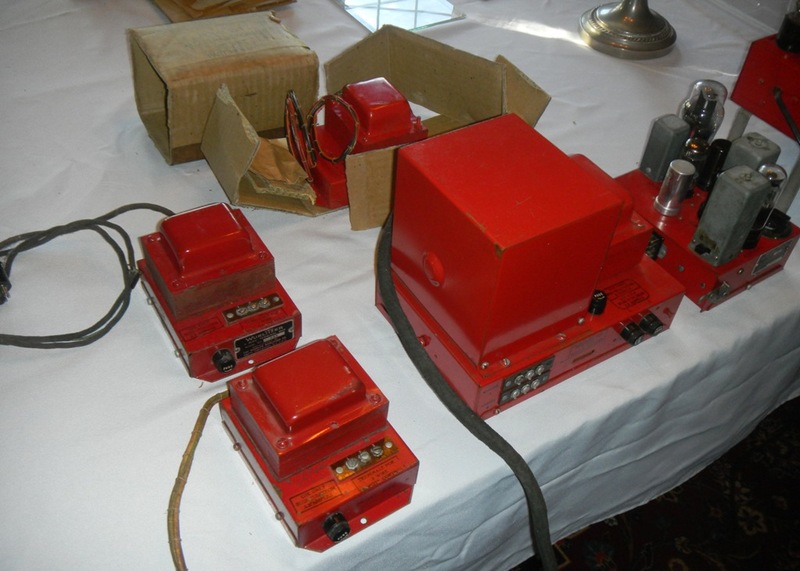 The normal 3025 serial number range began with 1,600,000. 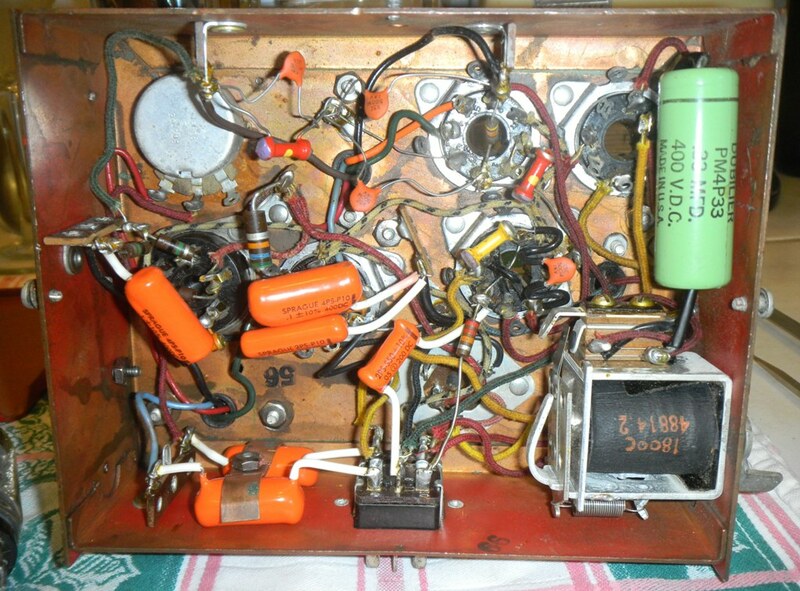 217 Auxiliary Amplifier NOS ?? 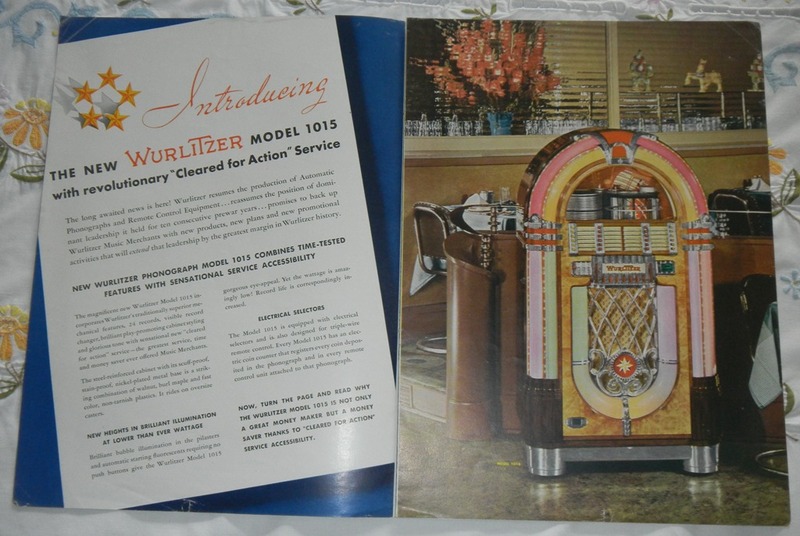 217 Stand for M 1015 Jukebox Very Rare NOS ?? 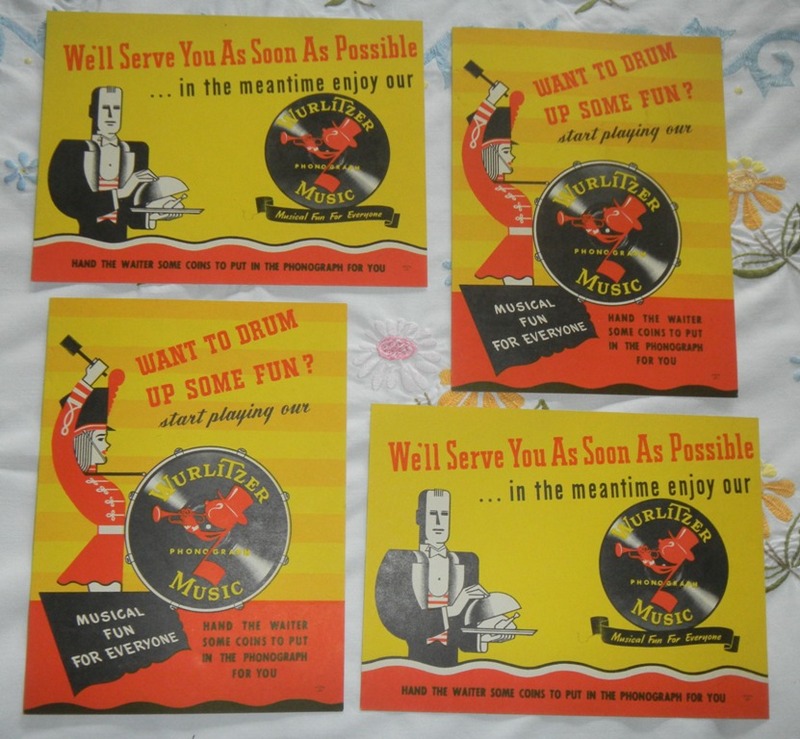 Johnny One-Note decals - Perfect size for the top cover of your jukebox's record stack (see photo). 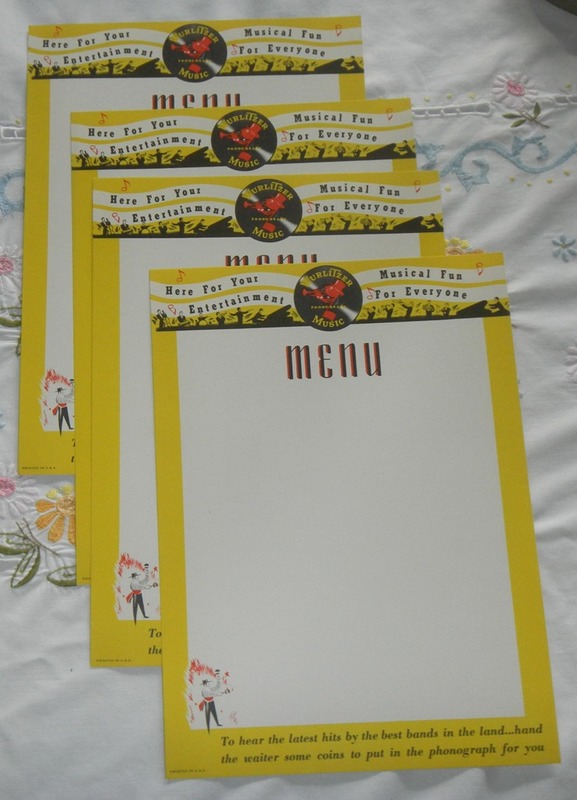 Restaurant promotional items -- various menus and table tents (see photos). 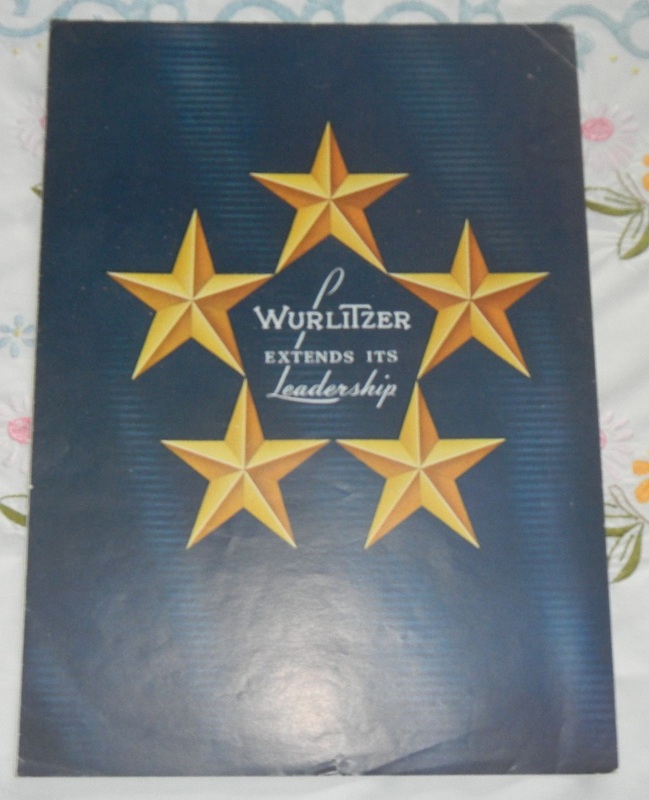 "Wurlitzer Extends Its Leadership" - 8 page in color. 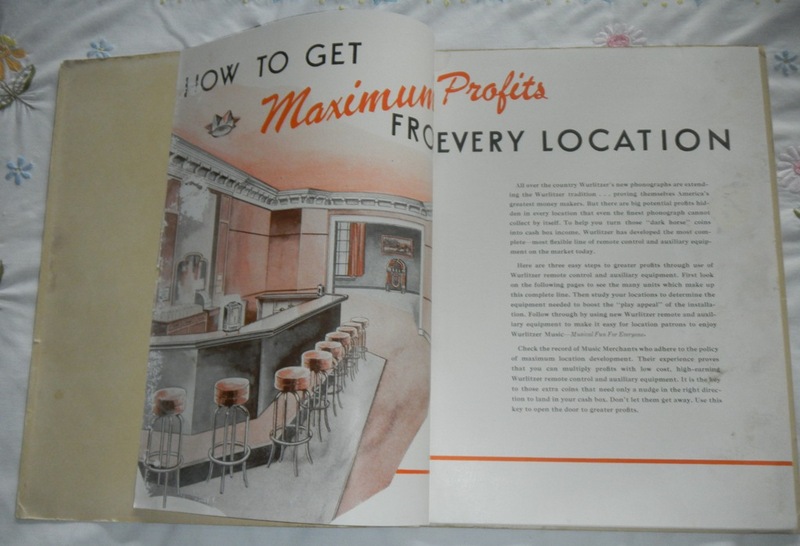 I believe this brochure was done in late 1945. It is before they came up with Johnny One-Note and the slogan "Musical fun for everyone". 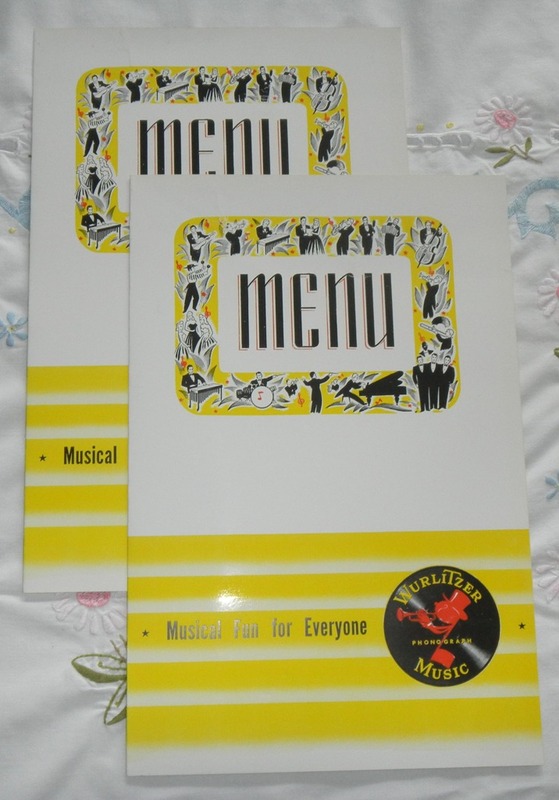 In the brochure, the slogan is "The name that means music to millions". 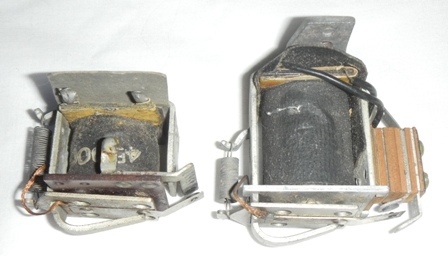 It shows a never made 3021 five-cent wall box that is convertible into wireless or two-wire much like the 3020. It doesn't show the 3025 or 3045. 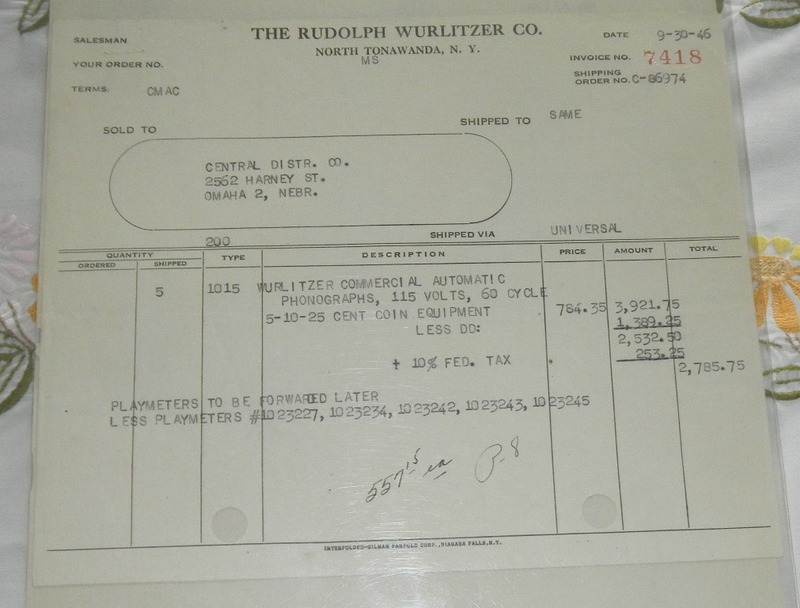 "Central Distributing Company" original multiple 1015 invoice and price lists plus copies of many other invoices for jukeboxes, speakers and remote control equipment. 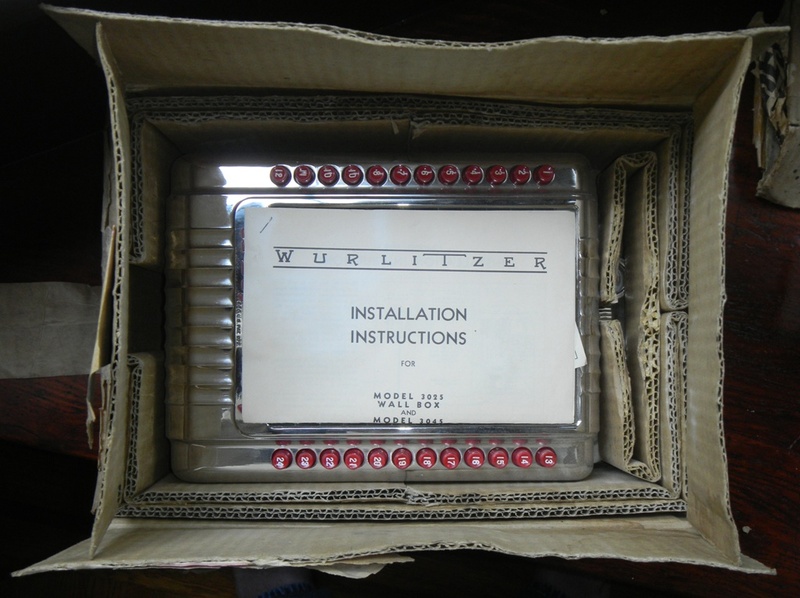 Installation instructions for remote control equipment. 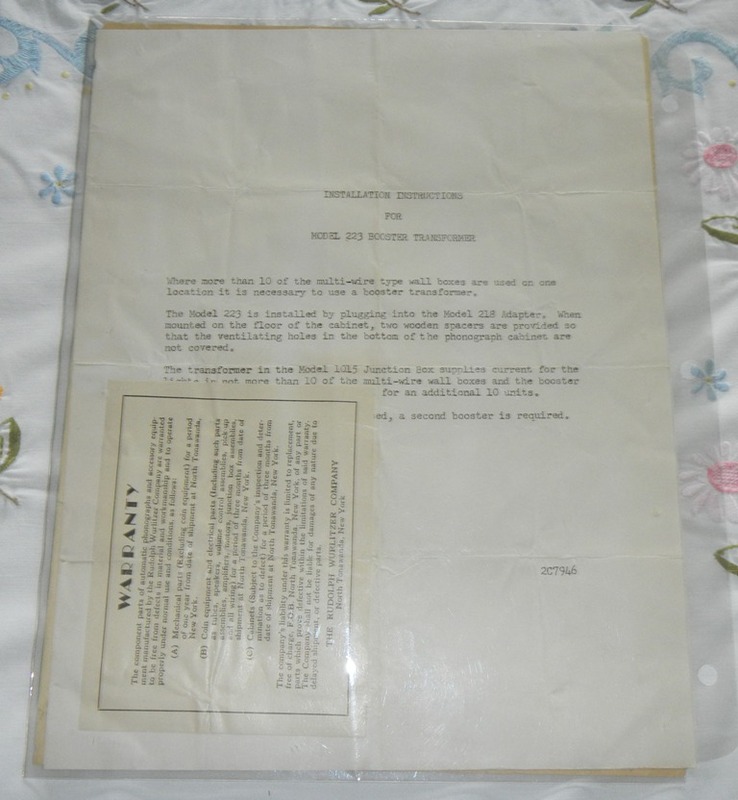 Part number 46790, August 1, 1946 - 4 pages. 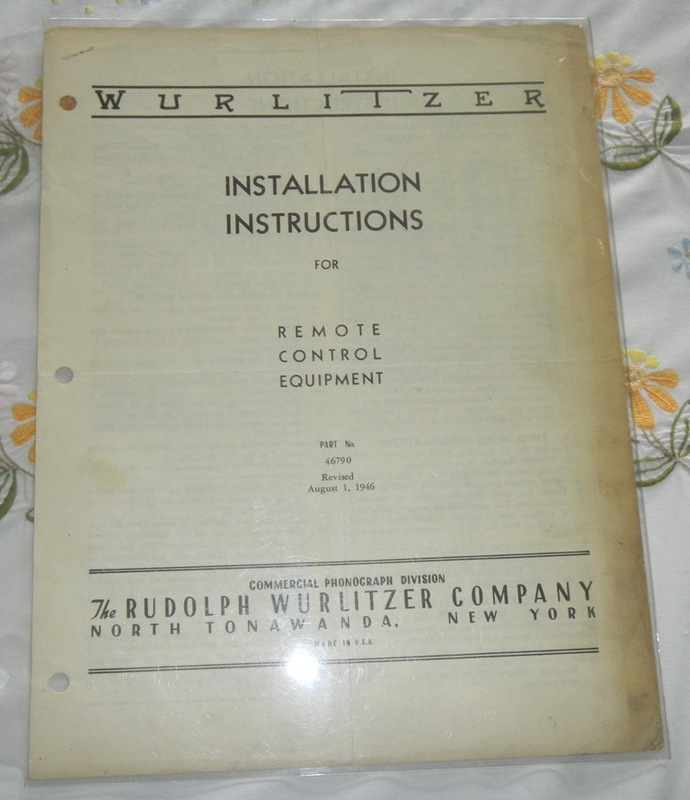 Installation instructions for 3031 and 218. One page. 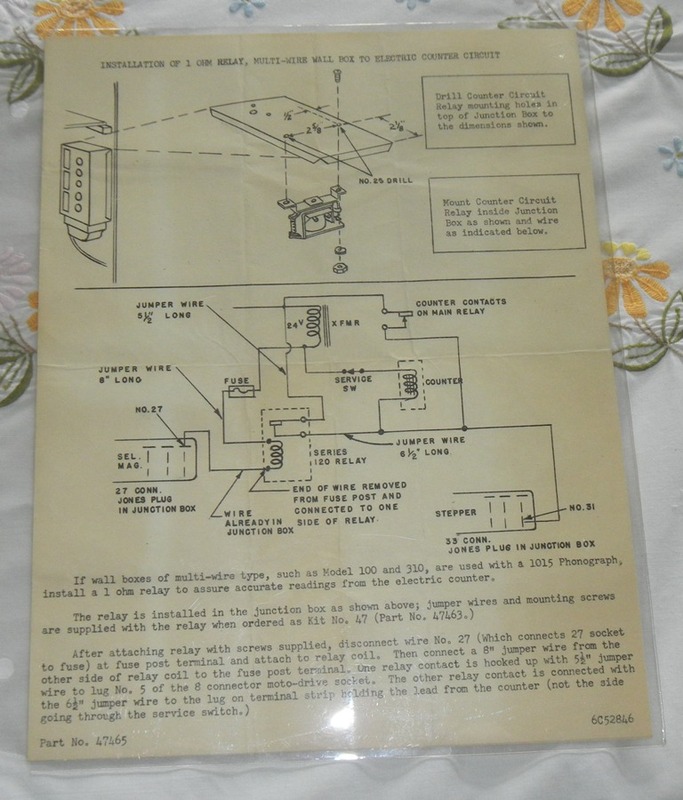 Installation instructions for model 222 booster transformer. One page. 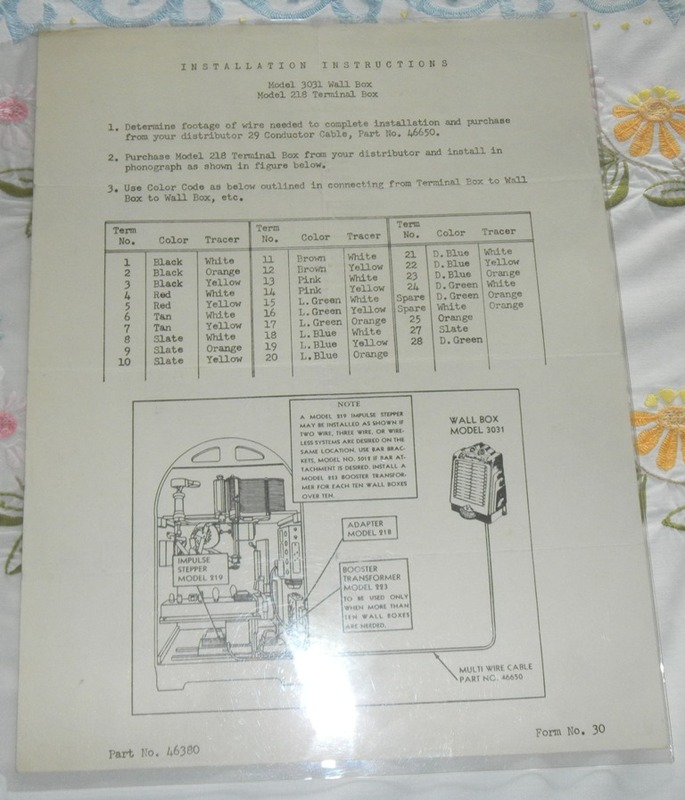 Installation instructions for model to 223 booster transformer. One page. Two copies. 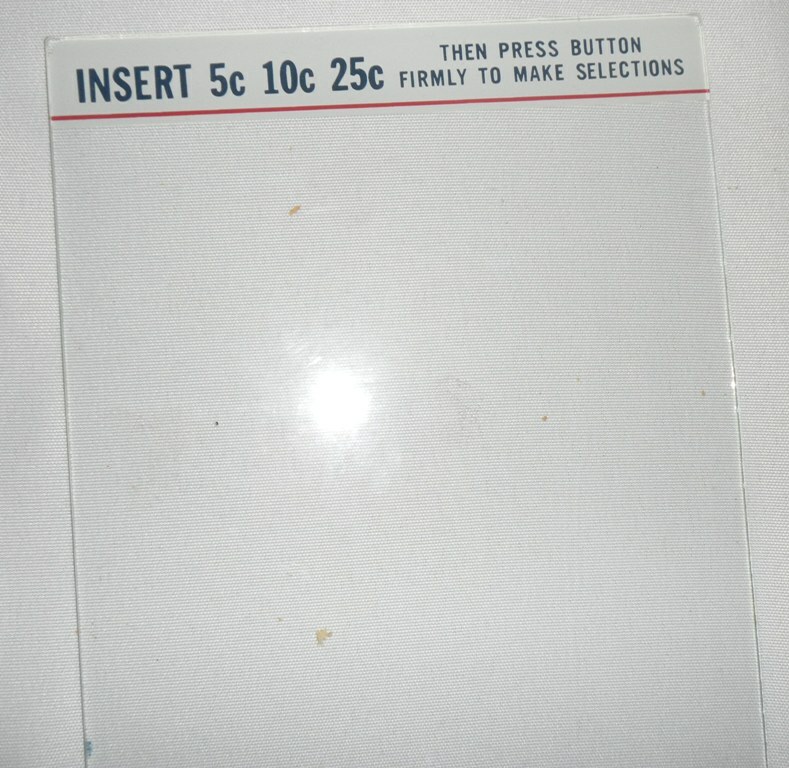 Warranty insert stuck to one. 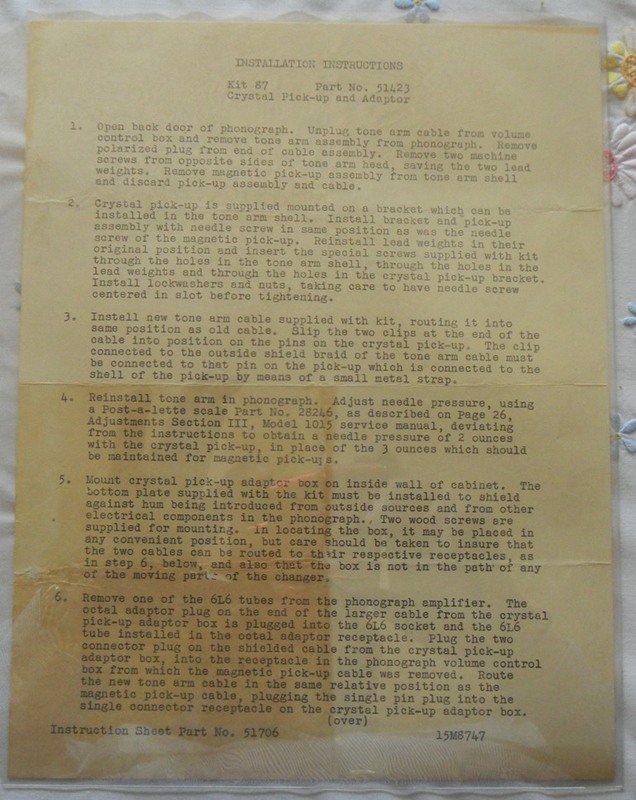 Installation instructions for Kit No. 87 -- Crystal Pickup Pre-amplifier. One page. 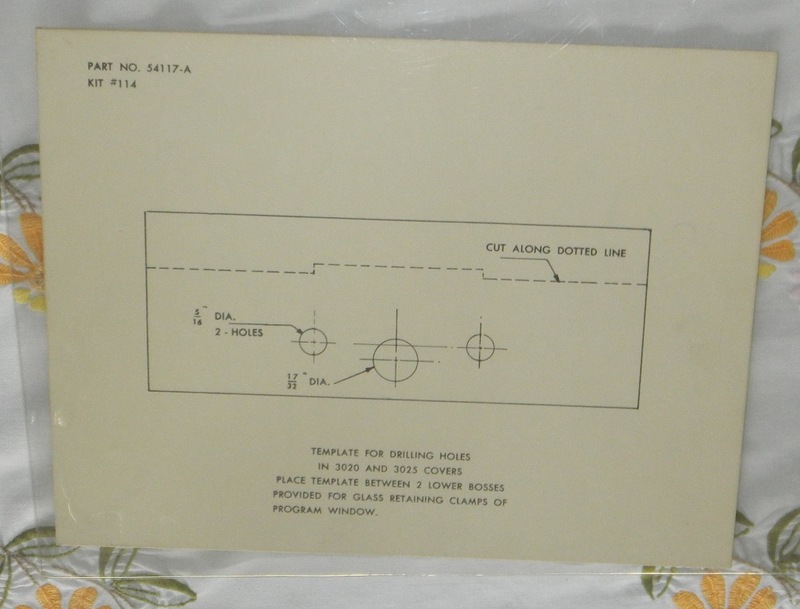 Three cardboard templates for Kit No. 114 -- adding a switch to a 3020 or 3025 wall box. 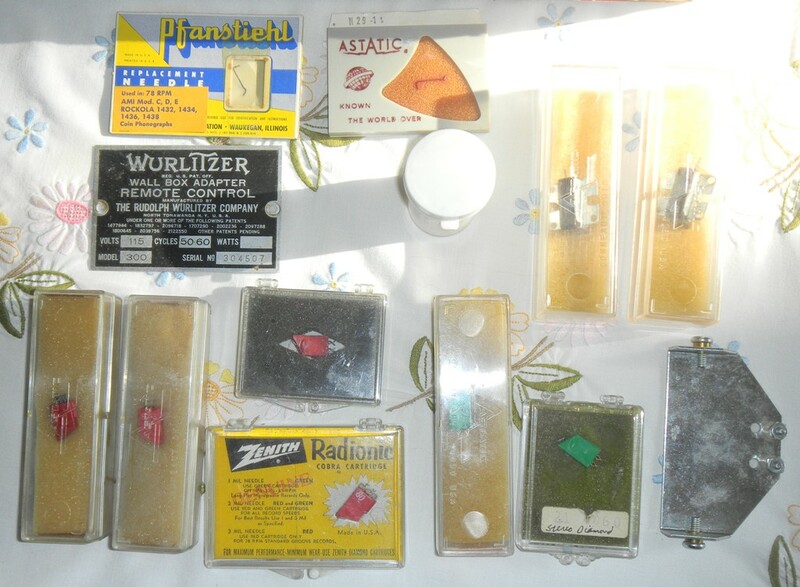 Parts, Cartridges and Needles -- see photos and descriptions below. 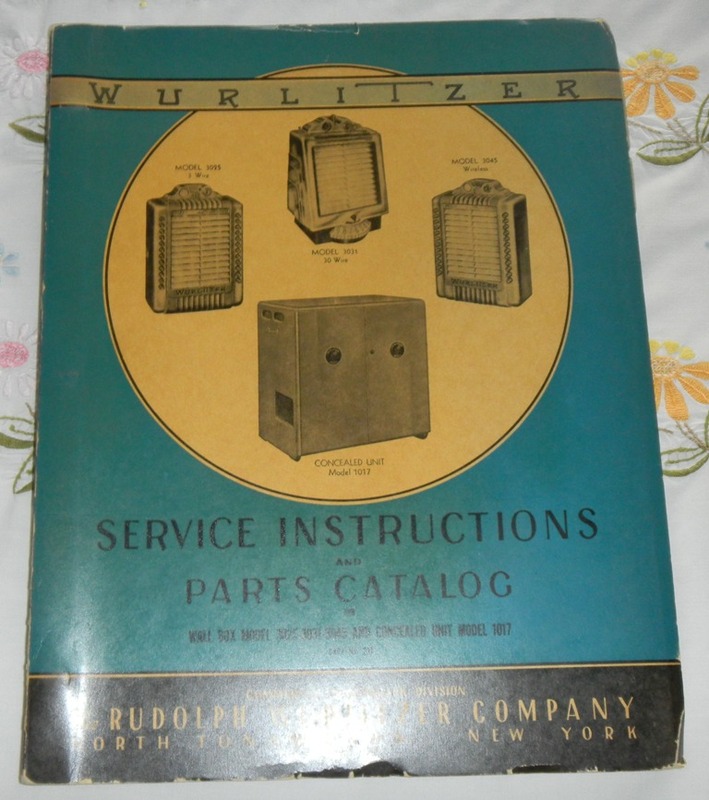 Wireless 3045 wall boxes weren't as reliable as 3020-215 combos; they didn't use crystals for tuning. 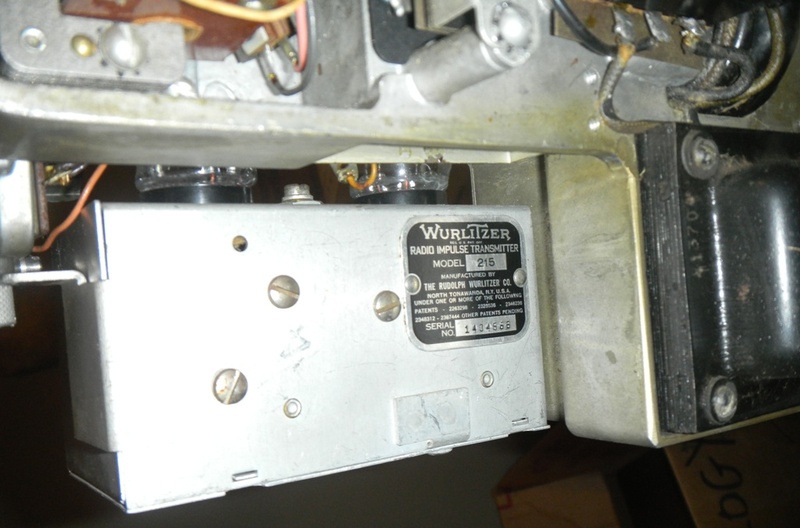 Consequently Wurlitzer converted surplus 3045's to 3025's by removing the wireless transmitter. Here is a brand new, boxed example. 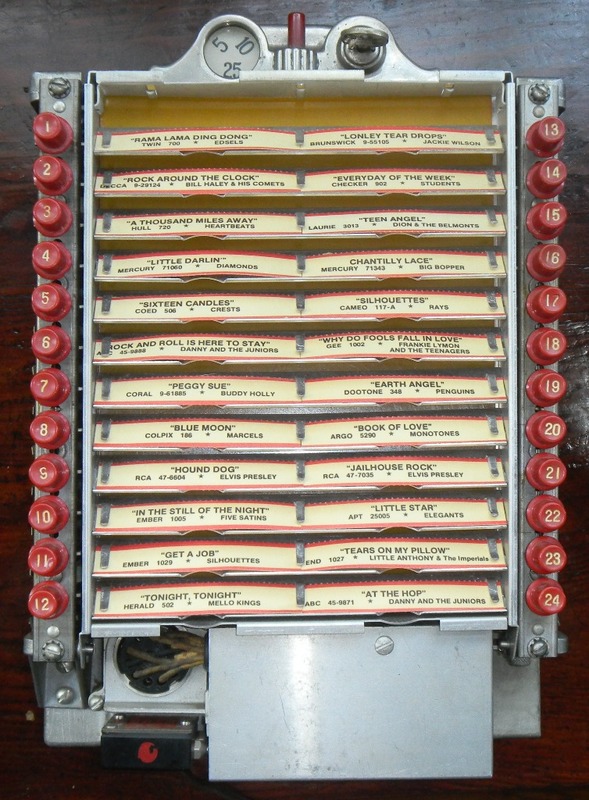 Since it still has the 3045 transformer, it would likely also work as a two-wire wall box. 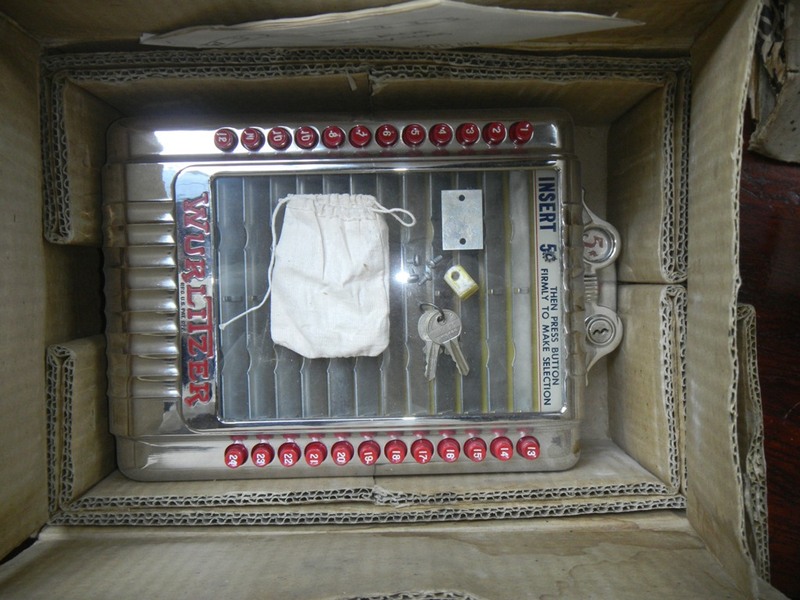 Serial number plate over-struck inside making the 4 into a 2. 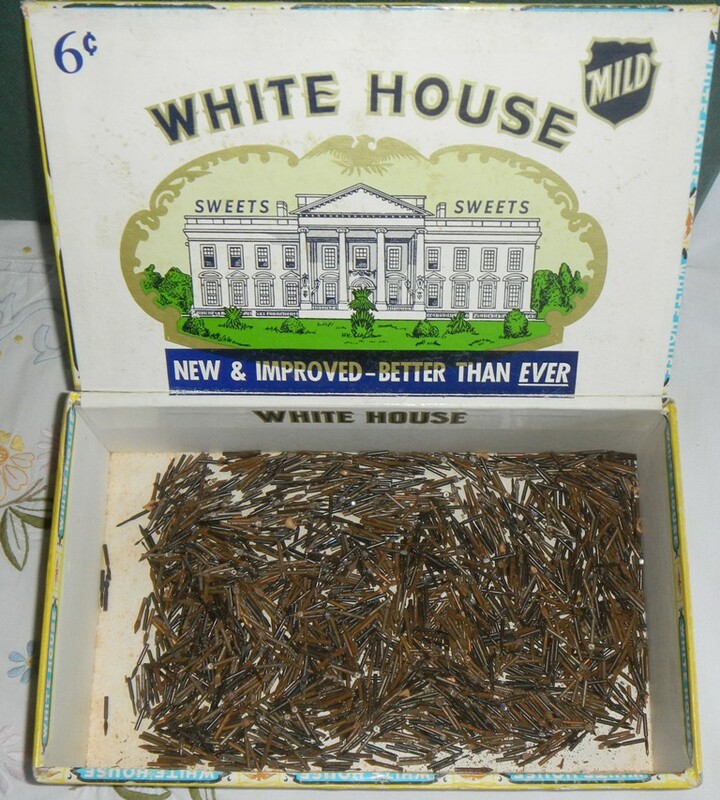 Box relabeled by hand. I've owned six 3025 wall boxes. Two were conversions like this. 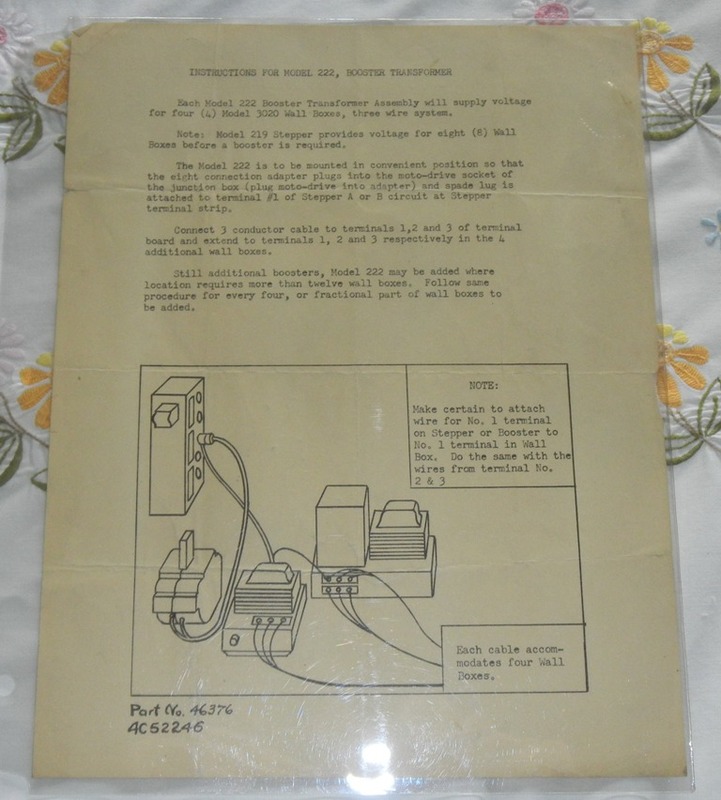 This one of the seven NOS 3045's that I bought from Ed Jones in 1979. I replaced the capacitors, and it works great. It has had maybe 200 nickels run through it. 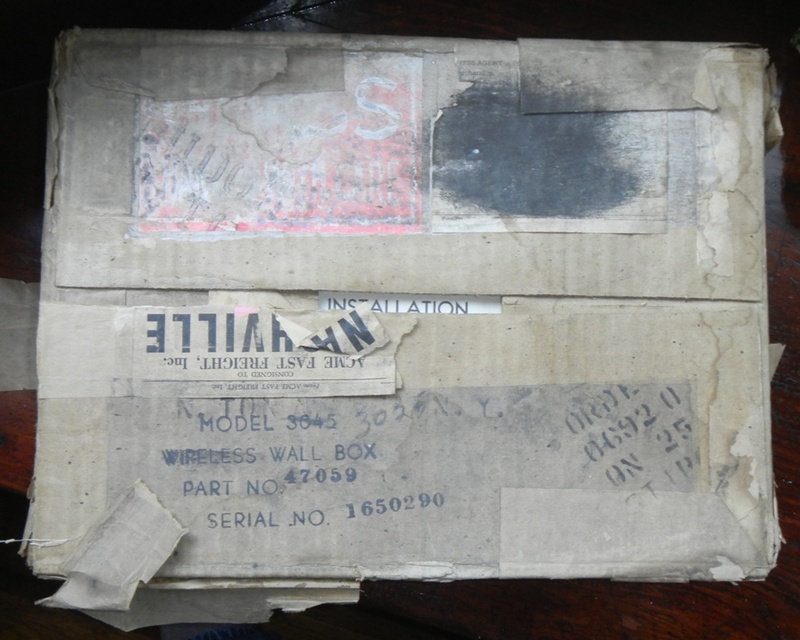 The nicks you see in the hammerloid finish of the front cover were there when it came out of its box. I've owned ten 3045's. This is the best of the 26 I've owned. It's all original and has never been polished. 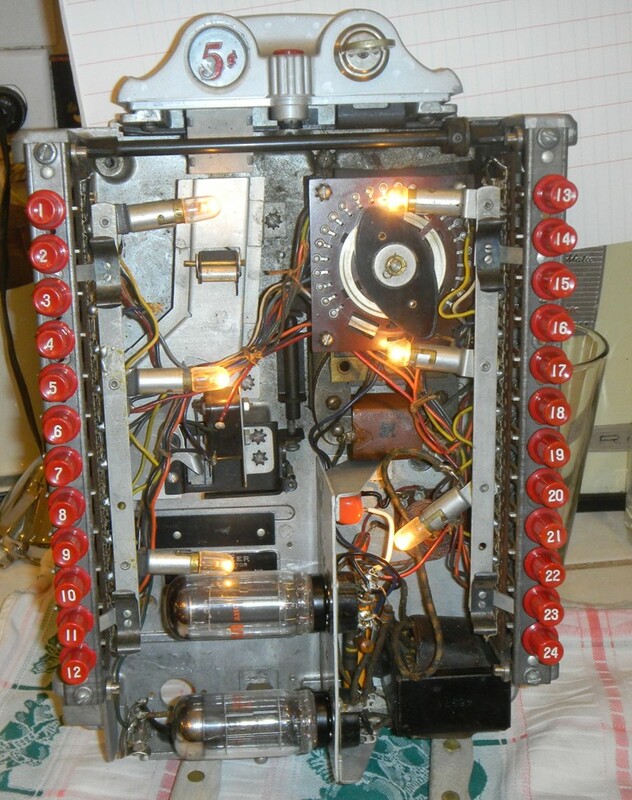 The 215 transmitter is NOS, and I replaced its capacitors. Works fine. This is the best red 216 out of 14 I've owned. I have a box for it somewhere. I replaced the capacitors, and it works great. 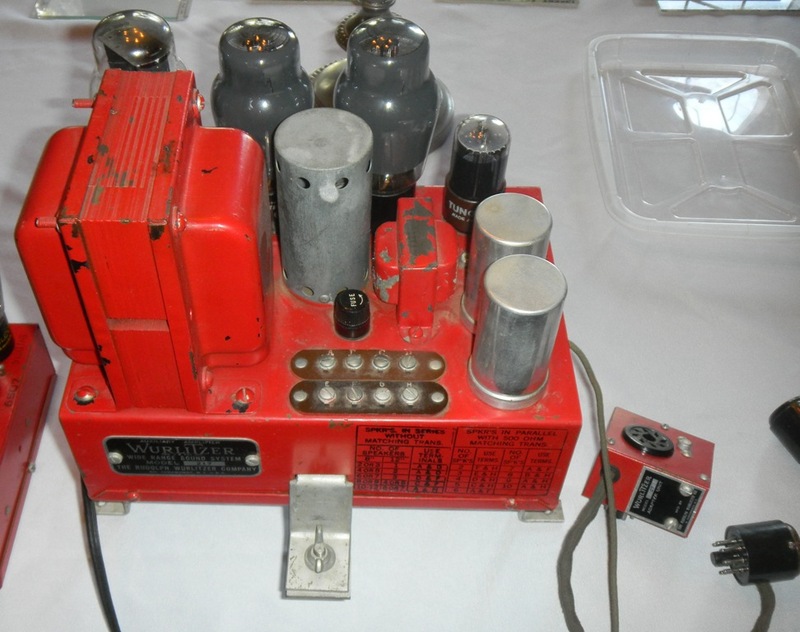 It originally had a 4,500 ohm relay. 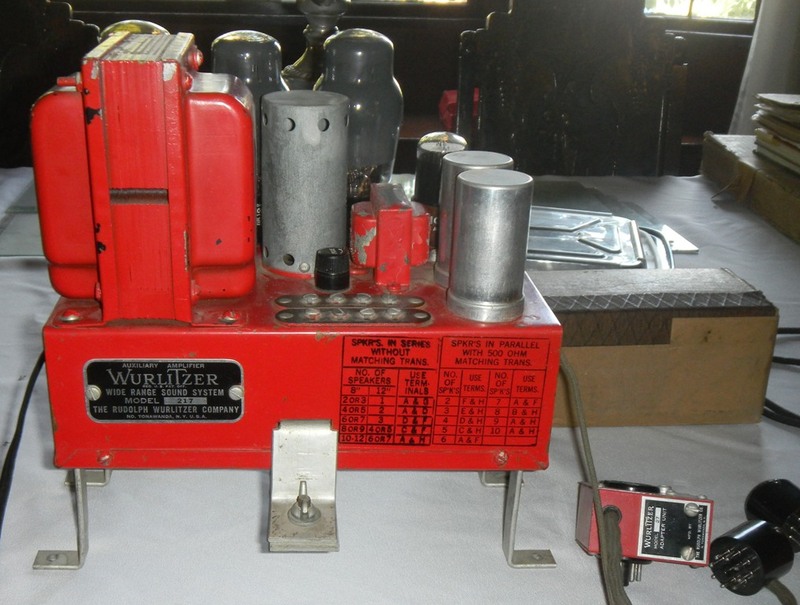 They were prone to false impulses, and Wurlitzer made a running change to 1,800 ohm relays. I installed a NOS 1,800 ohm relay. 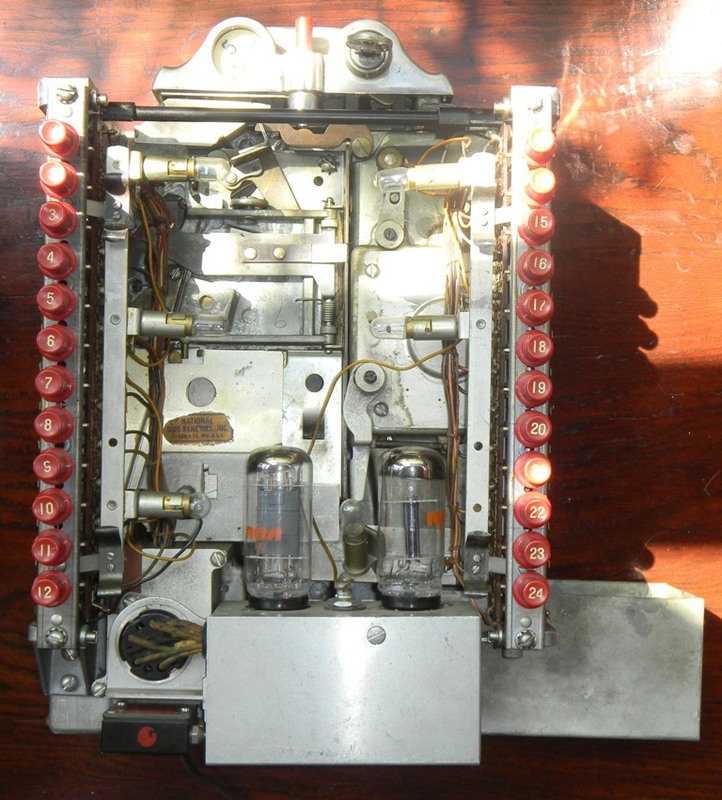 Along with this receiver you get two spares -- the original 4,500 ohm relay and another NOS 1,800 ohm relay with an interesting bracket on it so that this larger relay could be installed using the original, smaller relay hole. This is the best of the two I've owned. It is NOS and I'm still searching for its carton. 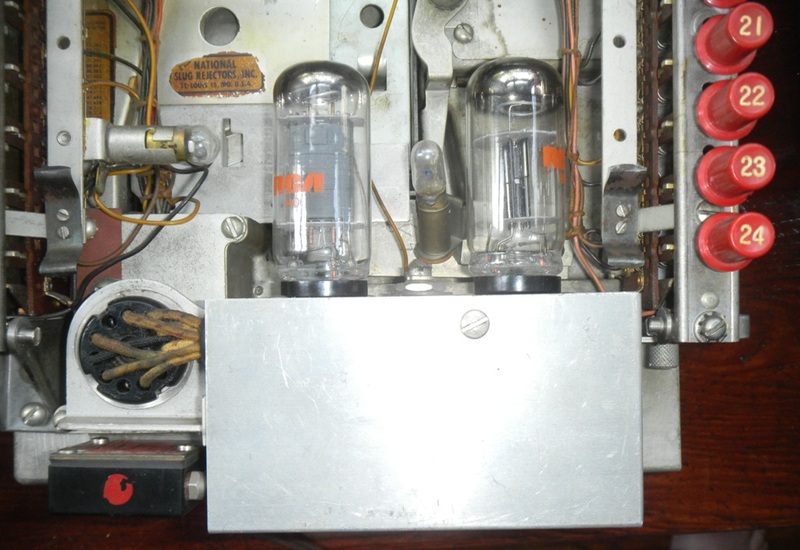 Note the jumbo vintage tubes. I replaced the capacitors internally leaving the two original cans on top. 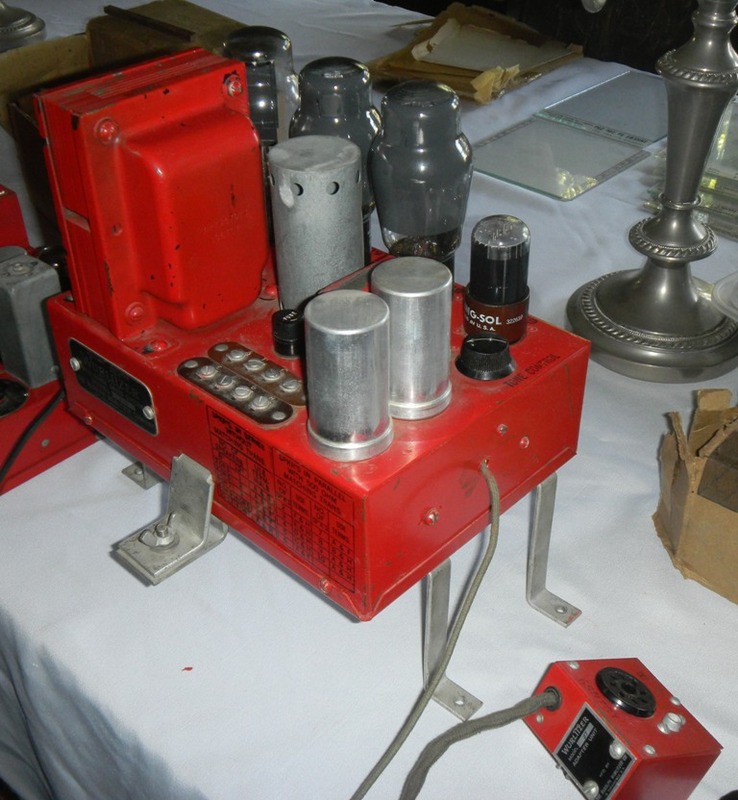 Its metal stand is very scarce. It raises the amp up, so the bottom lip of a 1015's front door has clearance. Bruce Brandenburg borrowed this stand to make excellent reproductions many years ago. I still have a few of Bruce's reproductions which I can't locate. They are likely in the same box as the missing cartons. The stand included here is the only original I have ever seen. The scabs you see on the red paint were there when I pulled it out of its carton. 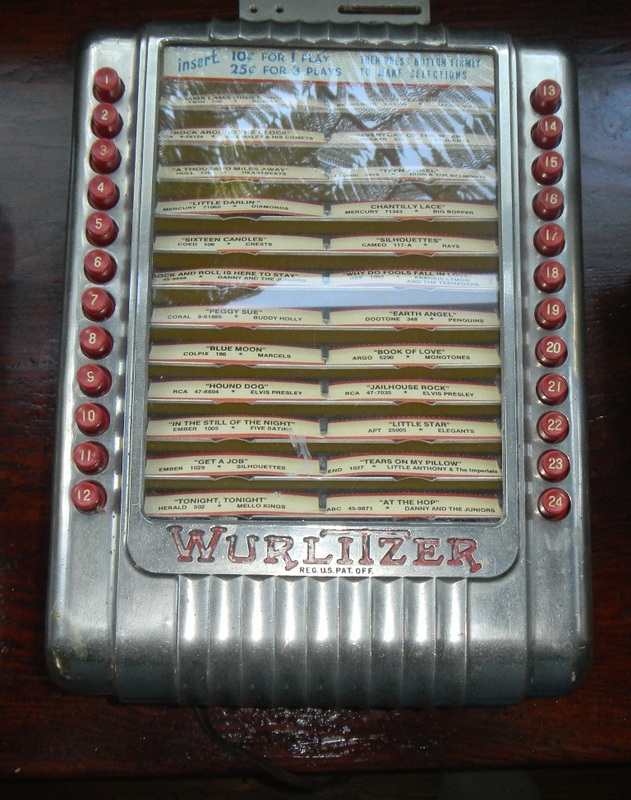 Wurlitzer didn't bother using primer. 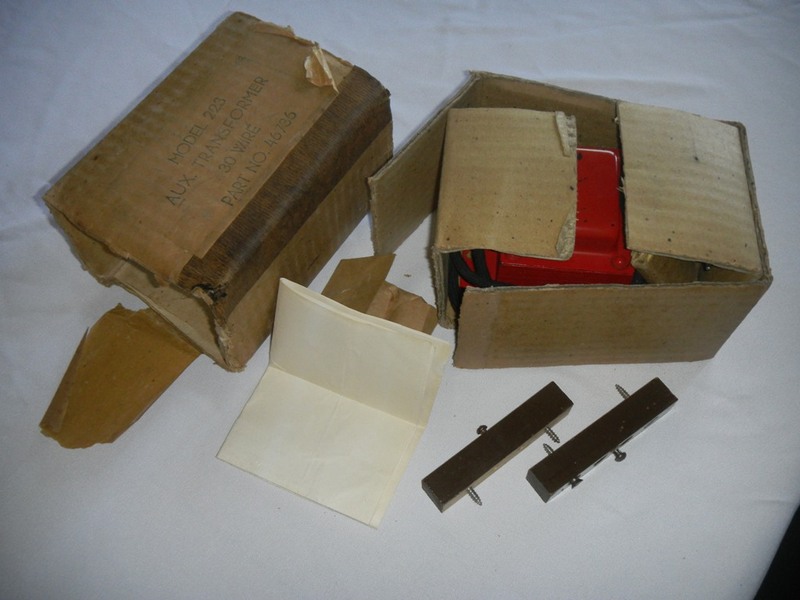 Included is the original carton for the NOS Model 227 adapter. This red 219 stepper is the one of the best out of 30 I've owned. I haven't yet located its original carton. Here are the best two of five model 222's I have owned. 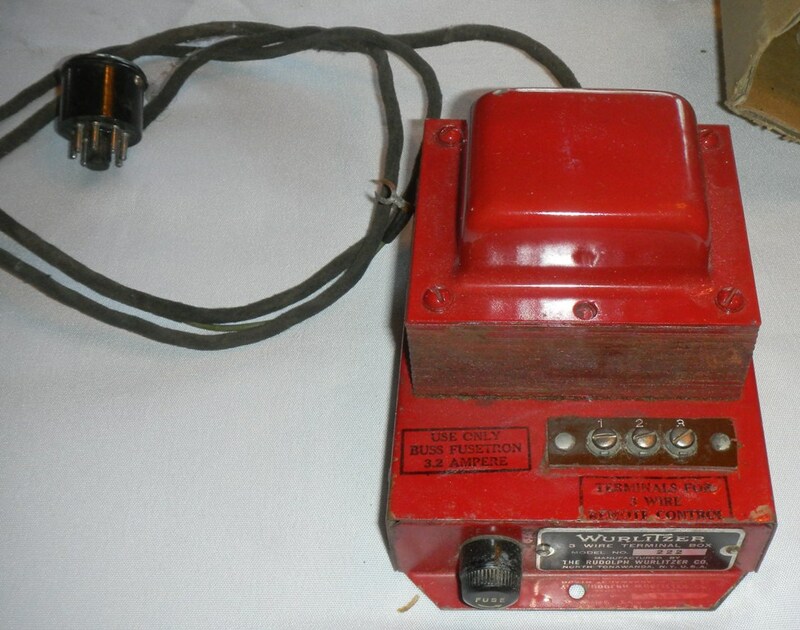 One has the top of its transformer repainted; this is the only paint touch-up in all of the items listed on this page. The other 222 is all original. 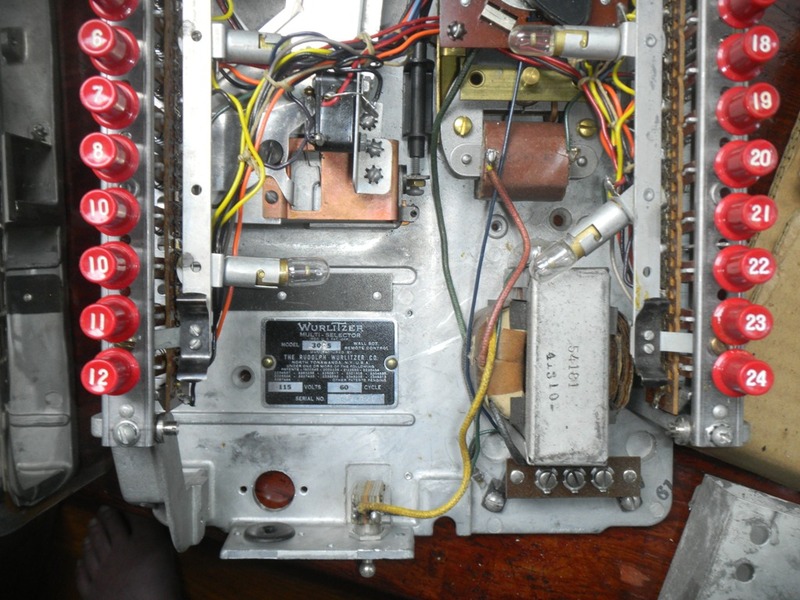 Here's a close-up of the one whose transformer top is repainted. This is NOS. In its carton are two wooden blocks that are used to raise it. They are not for the 223 to keep cool itself, but to avoid blocking the ventilation screens on the jukebox's floor. Good luck in getting everything back into the carton. 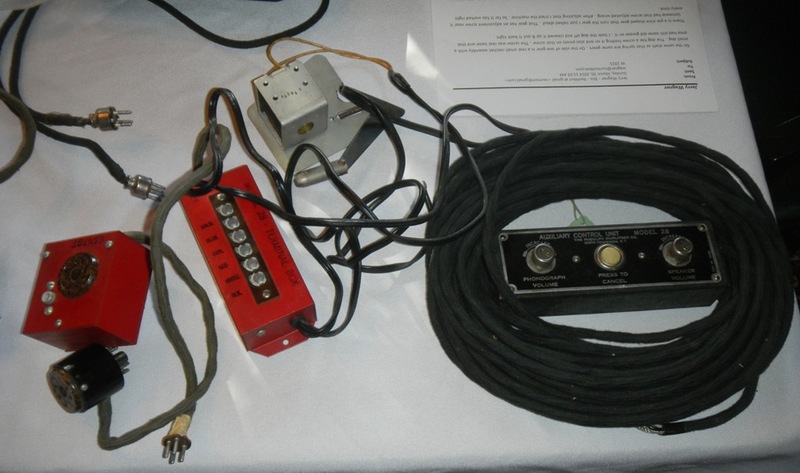 Here is a NOS Model 28 setup with cable. 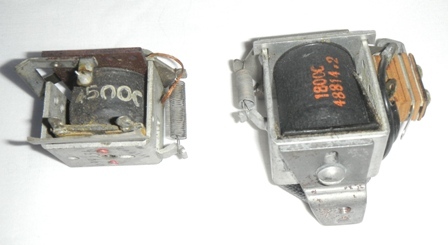 Remote volume and remote cancel (that's the cancel solenoid you see below). 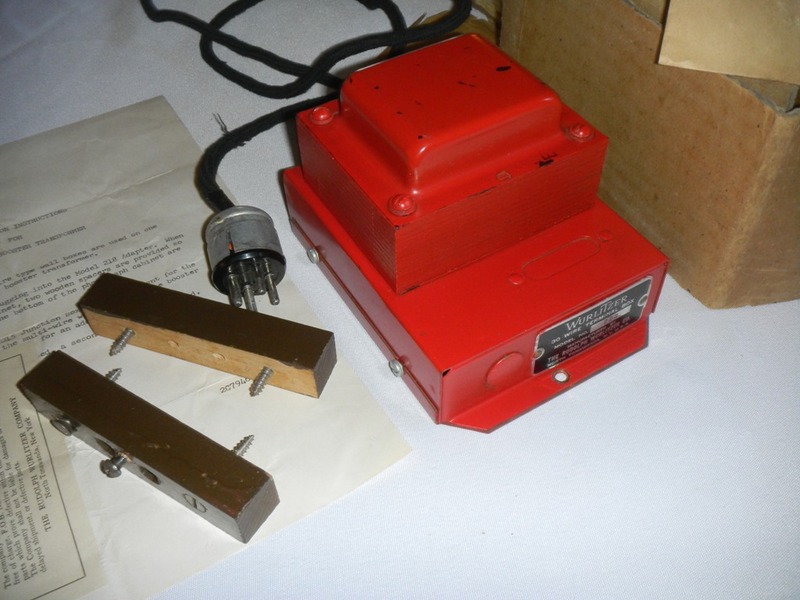 A Model 27 adapter accompanied the 217 auxiliary amp, but it would be much neater to use this Model 28 set up. 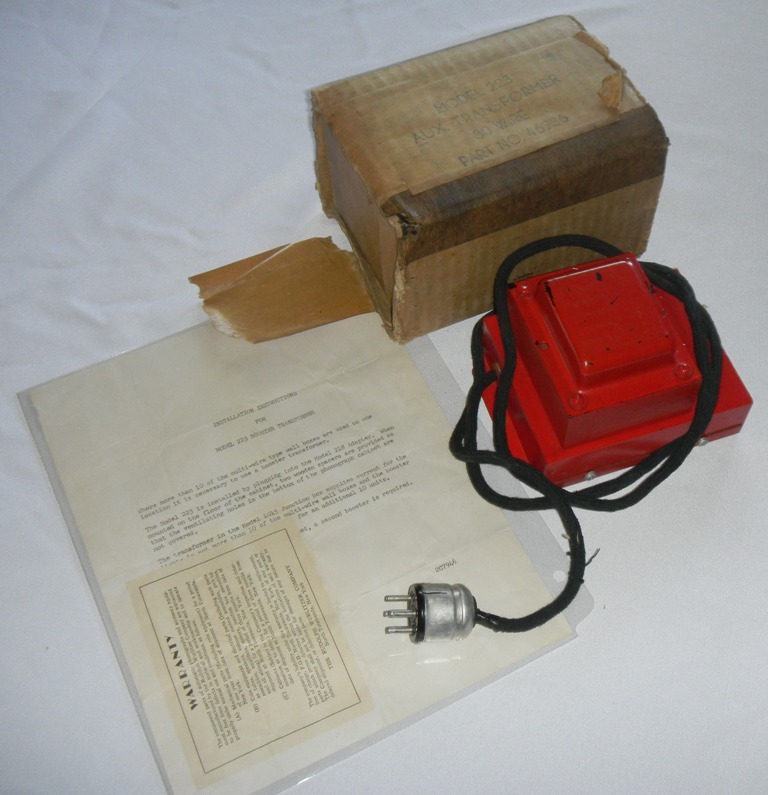 An extra model 28 adapter, pictured below, is included. 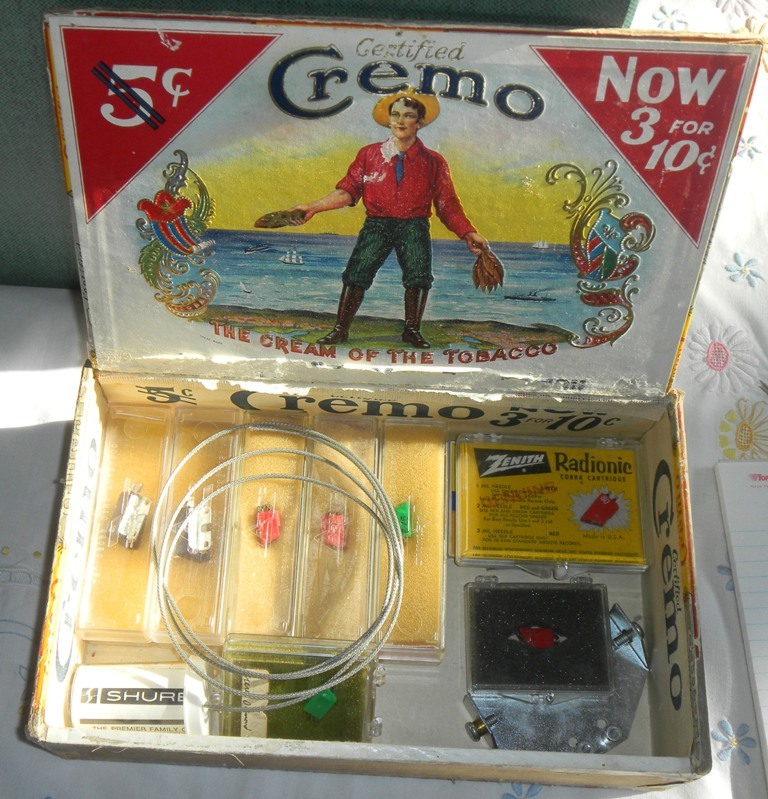 I have owned seven of these; three were complete. This is the best you will likely ever see. 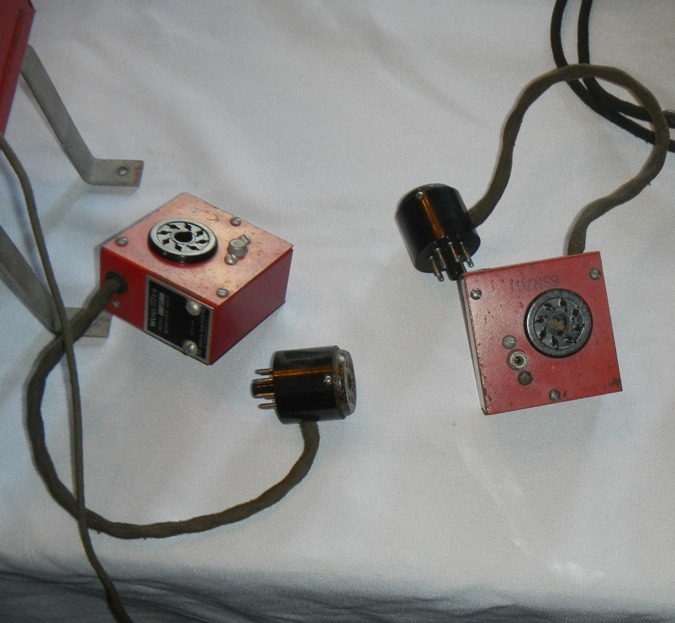 Below from left to right is a NOS Model 27 adapter, a used Model 28 adapter, and a NOS Model 28 adapter. 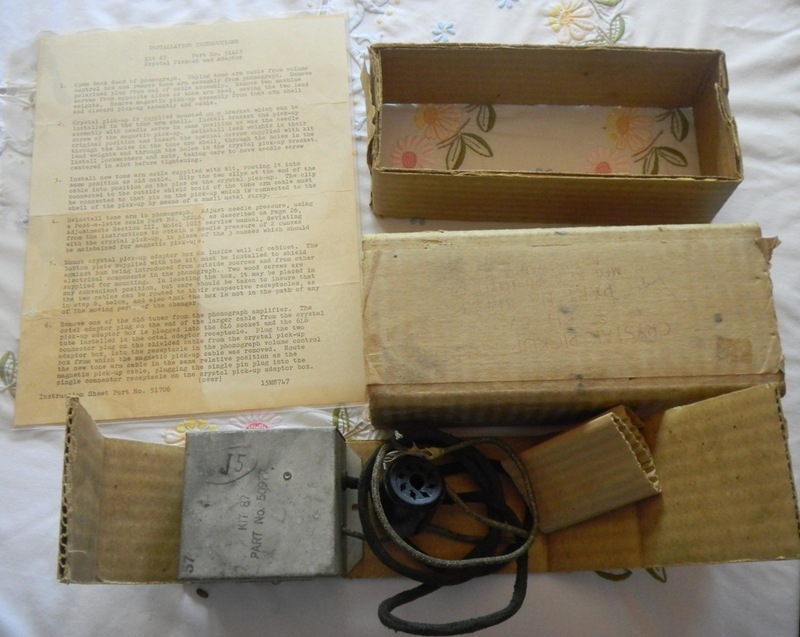 Here is a used, serviceable crystal pre-amplifier in a nice original box. Brand-new in original box. Note the beautiful crackle black paint. 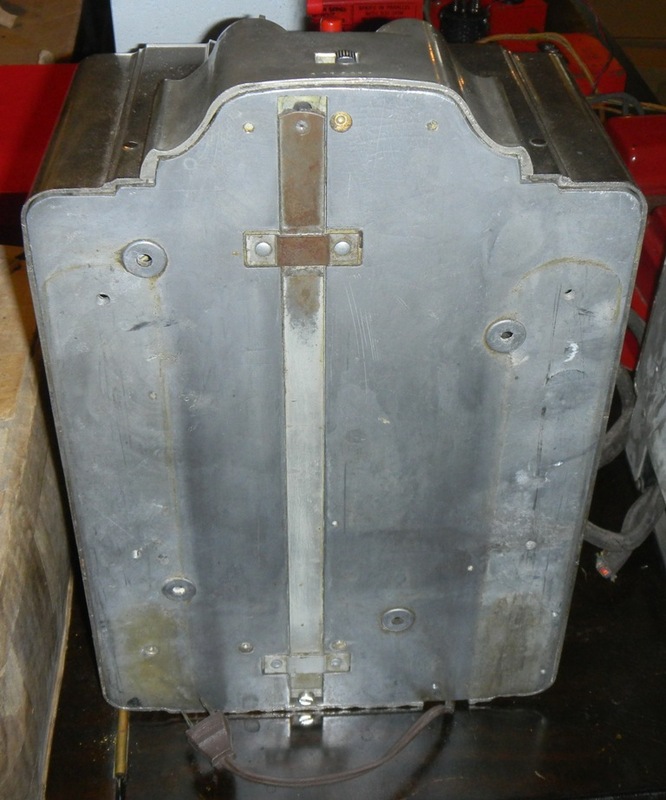 There are two of the heavy cast elbows and a backing plate for the wallbox. 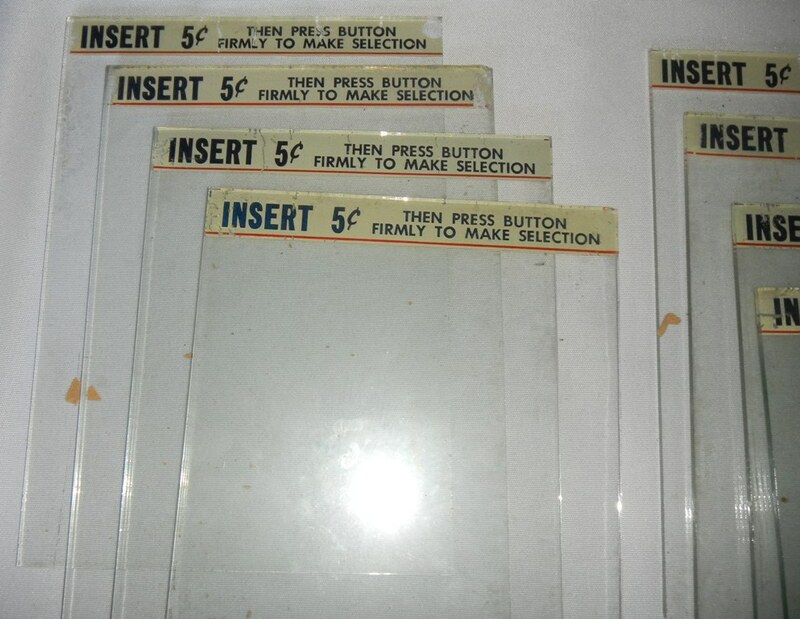 Here are 11 pieces of NOS 5¢ wall box glass plus a used one. A few are very nice. 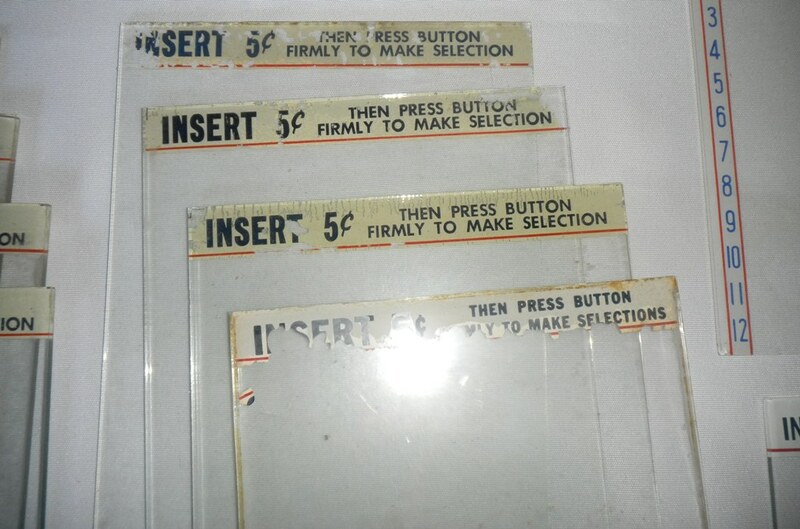 They were interleaved with cardboard and some sort of paper which, after 65 years, adhered to the glass and messed up the stenciling. See the photos below. Also included is one glass for a 3031 and one for a 3020. I cannot remember if these are original or not. 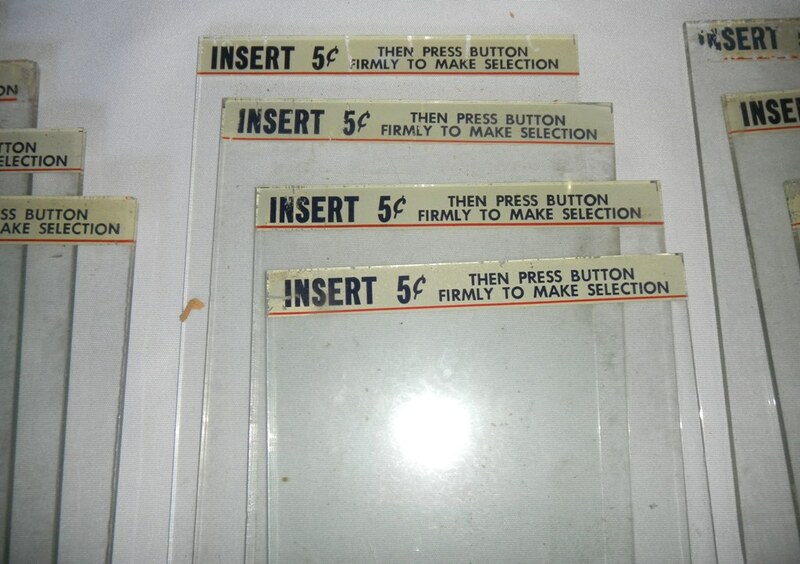 Here are the cardboard and paper inserts that separated the 5¢ glass shown above. 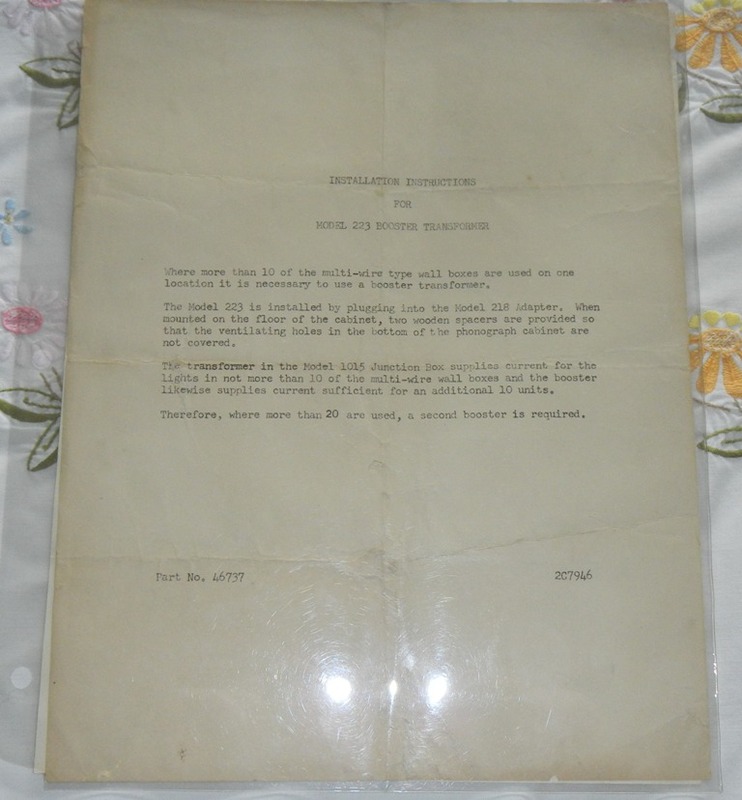 After 65+ years, they had adhered themselves to the glass, causing the damage. Eight pages. No MFFE. No Johnny One-note. 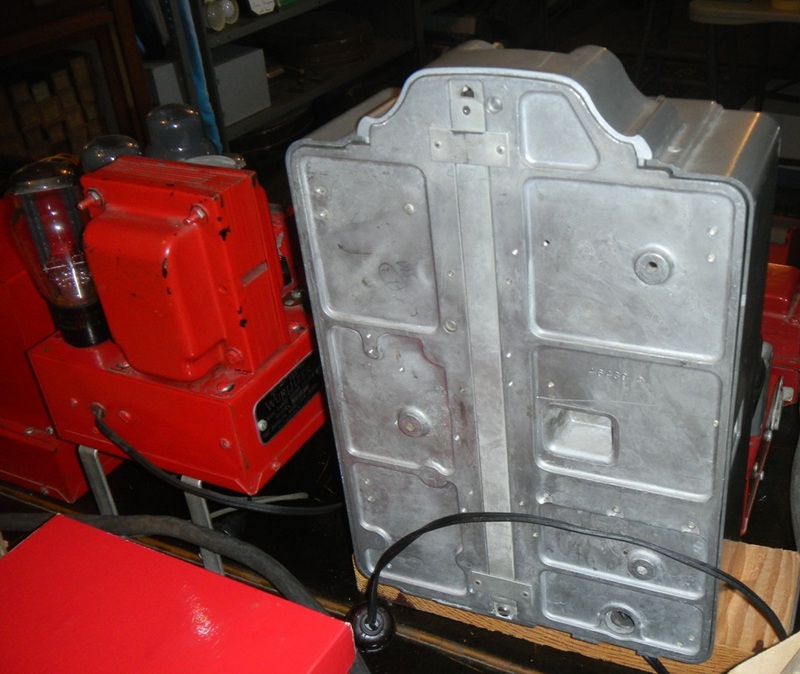 Mentions a 3021 wall box which was never made. Shows a 3020 and 3031, but no mention of a 3025 or 3045. 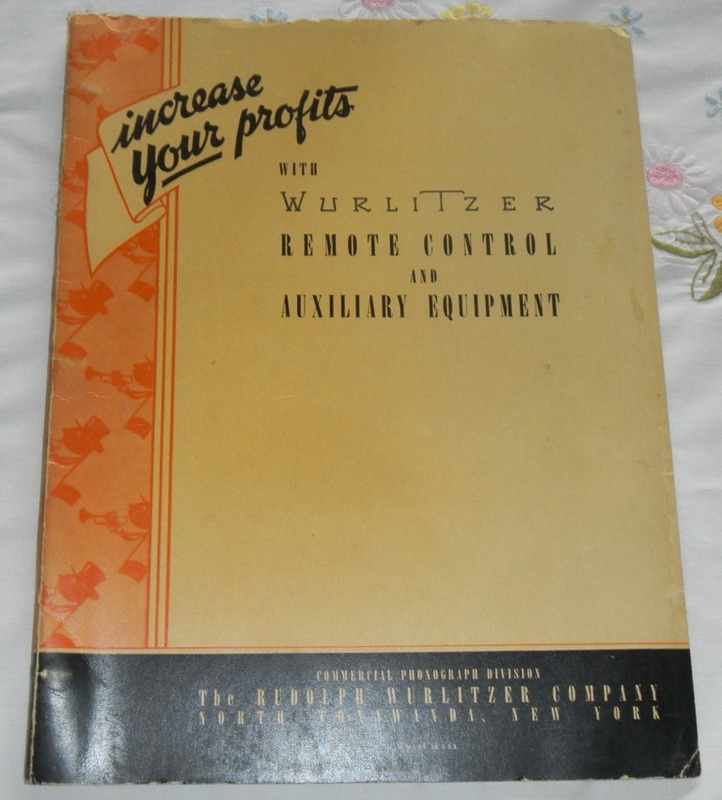 "Increase your profits with worlds remote-control auxiliary equipment" – 40 pages – cardboard covers - part 292. Very nice condition. 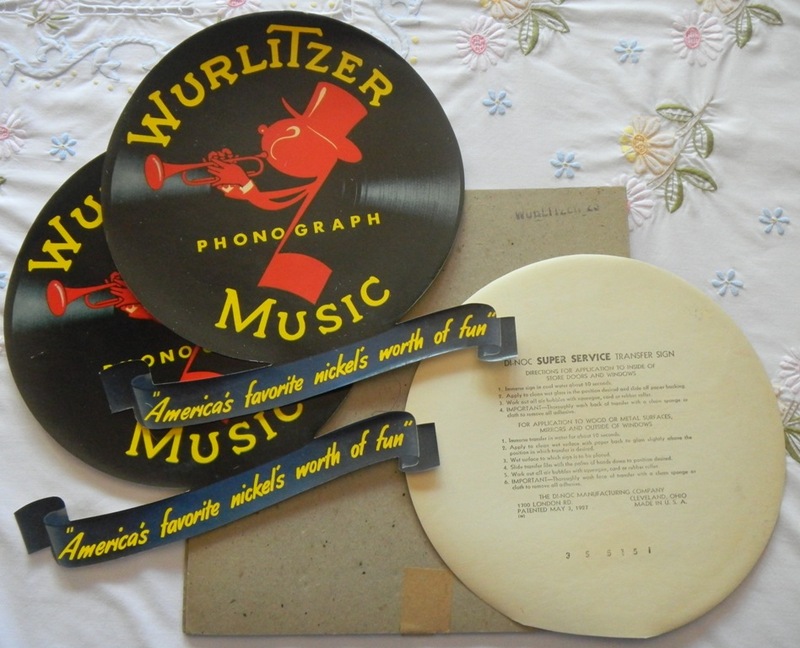 Wurlitzer went whole-hog in 1946 with an advertising campaign featuring Johnny One-Note. 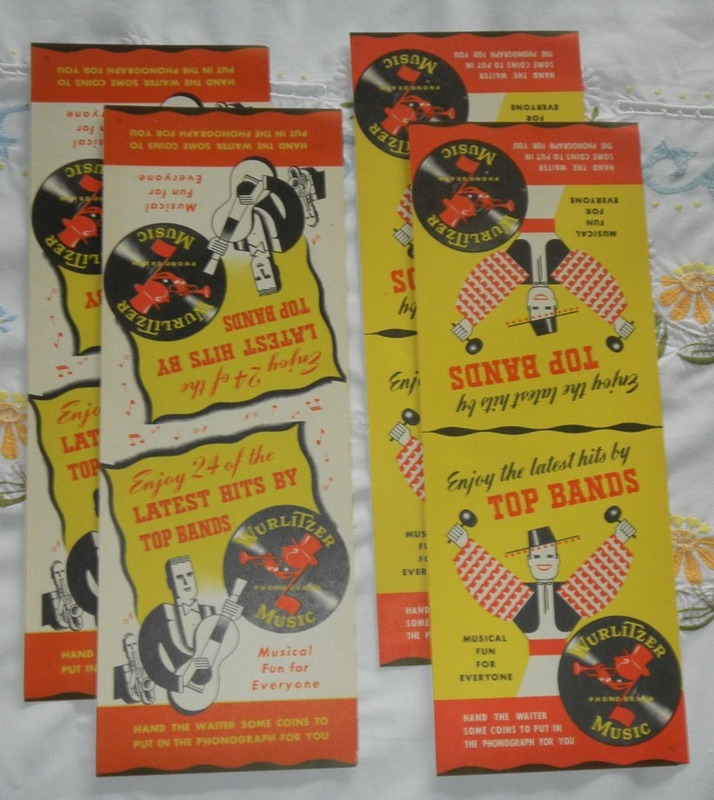 Here are three decals with their original packaging which held 25 of them. Two are complete; one has the banner trimmed off. 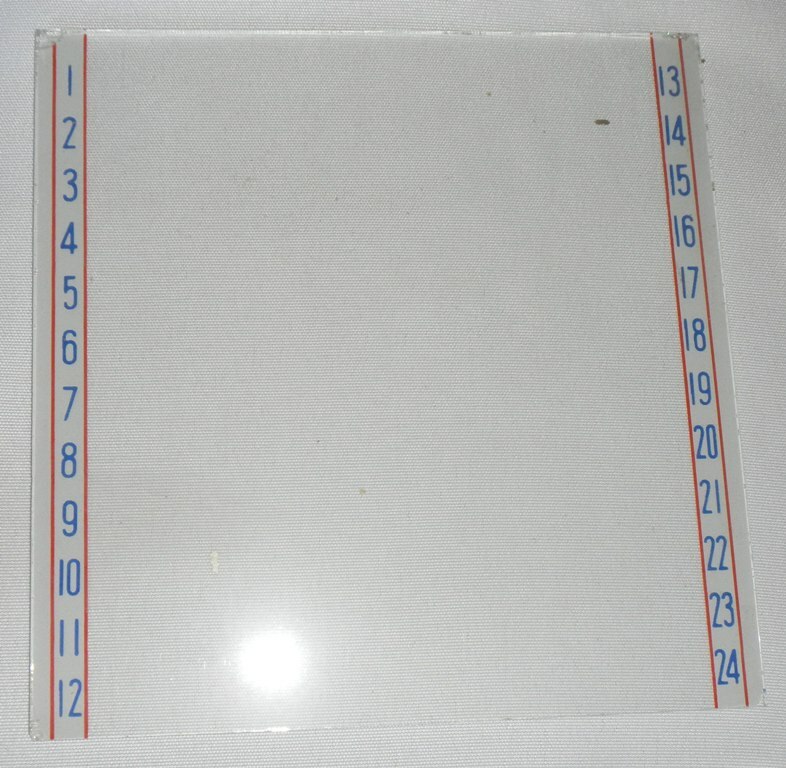 I used to put the record decal on top of the 1015 record stack. 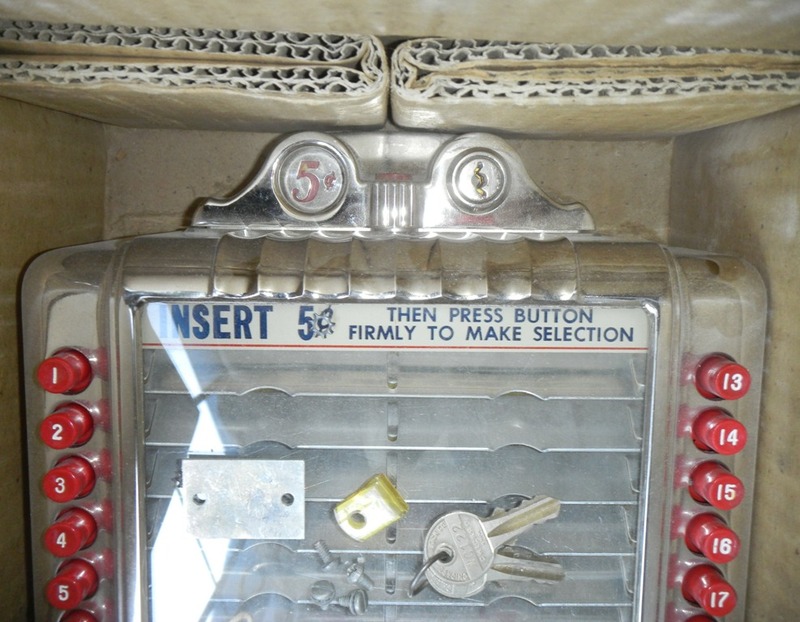 I then applied the banner to the inside of the jukebox's front door glass. These decals have glue on both sides and are nearly 70 years old. These are in beautiful condition and have cardboard covers. Some are photographed above with the equipment they accompany. A list is near the top of this page. 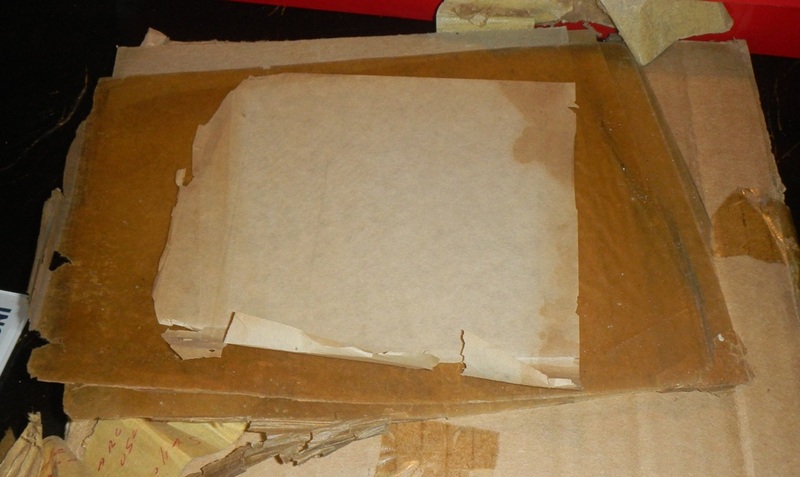 They've been stored in archival Mylar for the last 35 years. 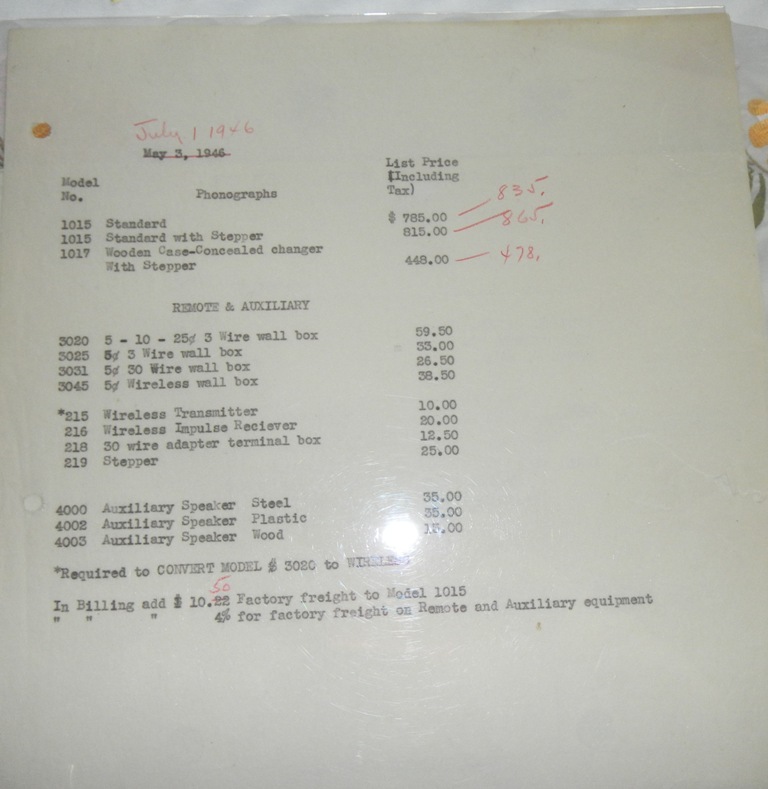 Besides these two originals, a bunch of photocopies are included - some showing wallbox and speaker invoices. 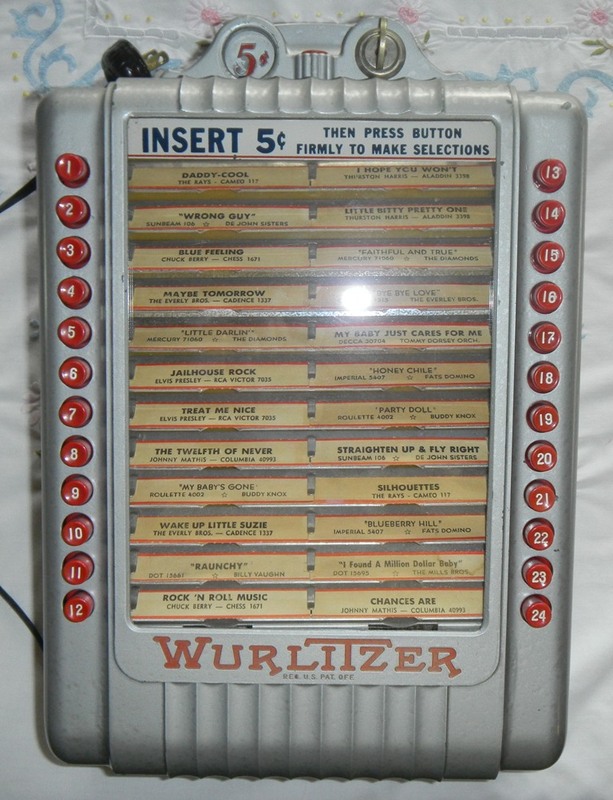 Note that Wurlitzer couldn't keep pace with Popularity Meters. Maybe they used an outside contractor. 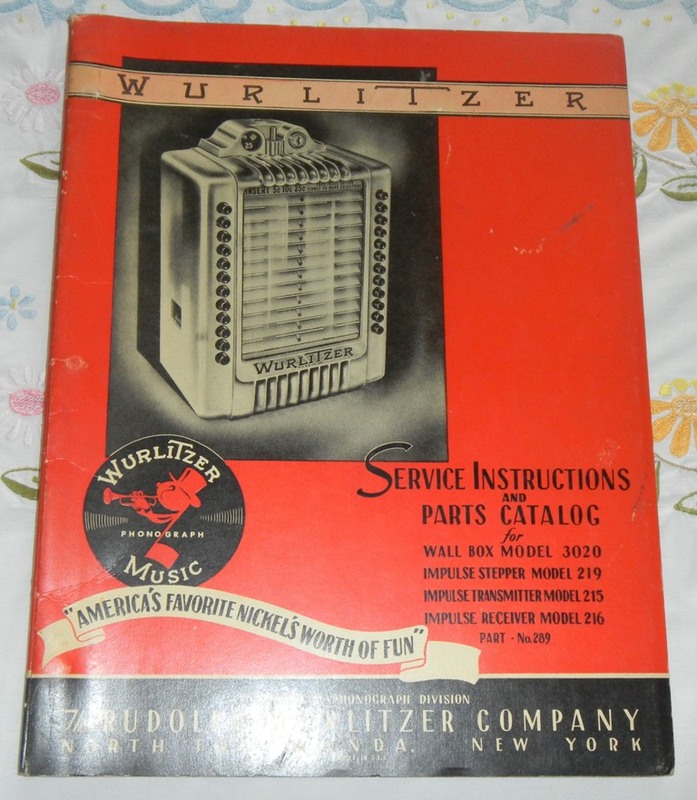 For various Wurlitzer gear. 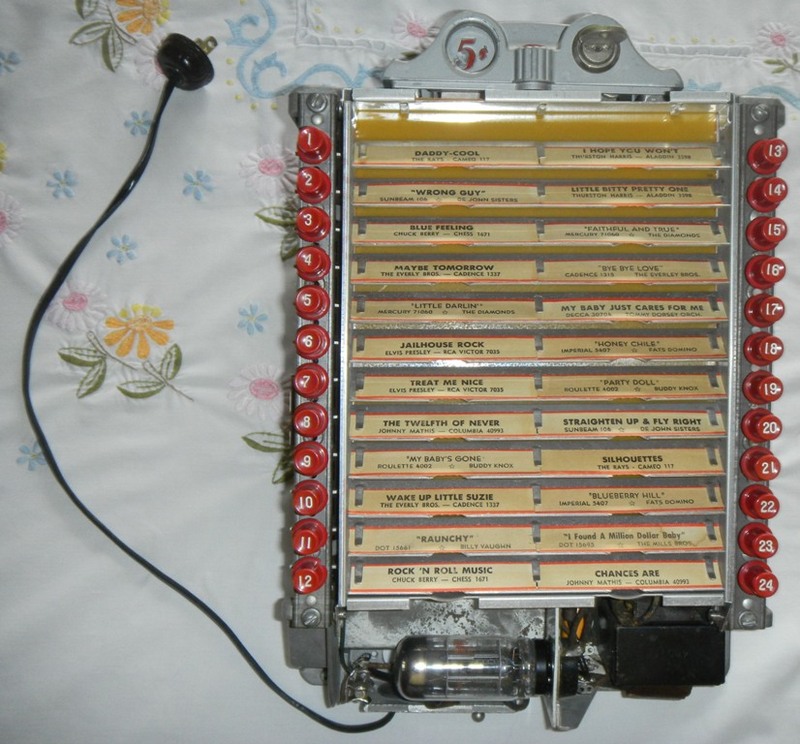 A few Seeburg are included. I sold my NOS Frog set-up many years ago. This turned up when unpacking in 2014. 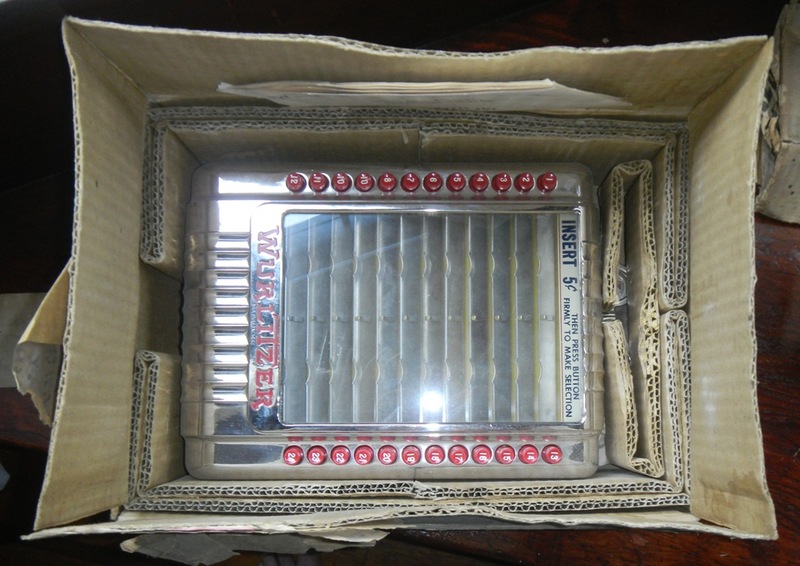 You can be the only person on your block with 500 or so original Wurlitzer spade needles. 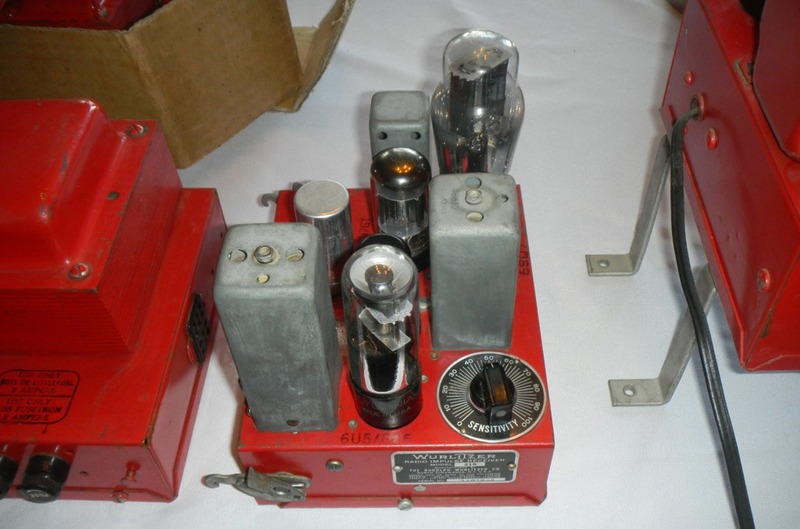 The more useful items are four new Red Cobra cartridges (one in a nice Zenith case), two new Green Cobra cartridges, two new Astatic 51-2 cartridges with needles and a new light-weight tone arm adaptor, one Pfanstiehl needle for AMI and Rockola, and one Astatic N29-1 needle. Forget the Shure cartridge -- it's for my stereo. 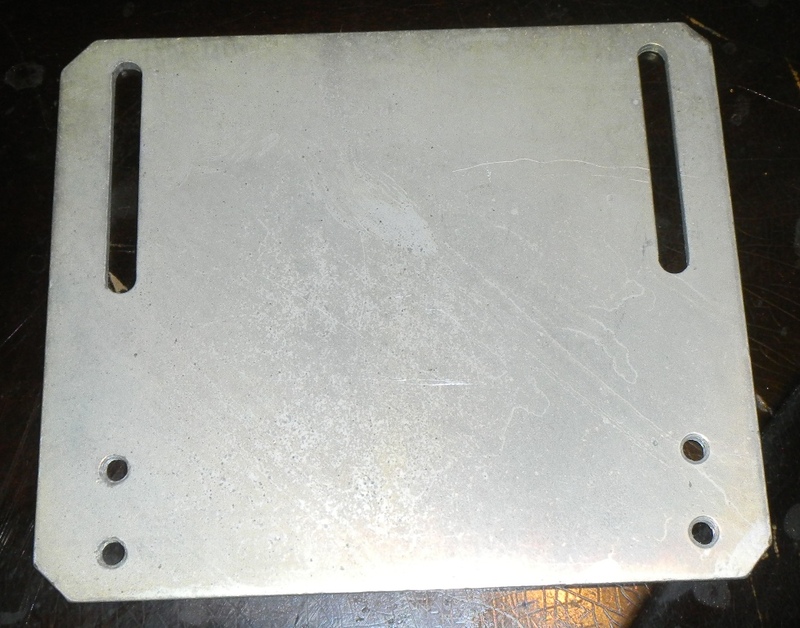 A bonus is the M300 serial plate which was in this cigar box. 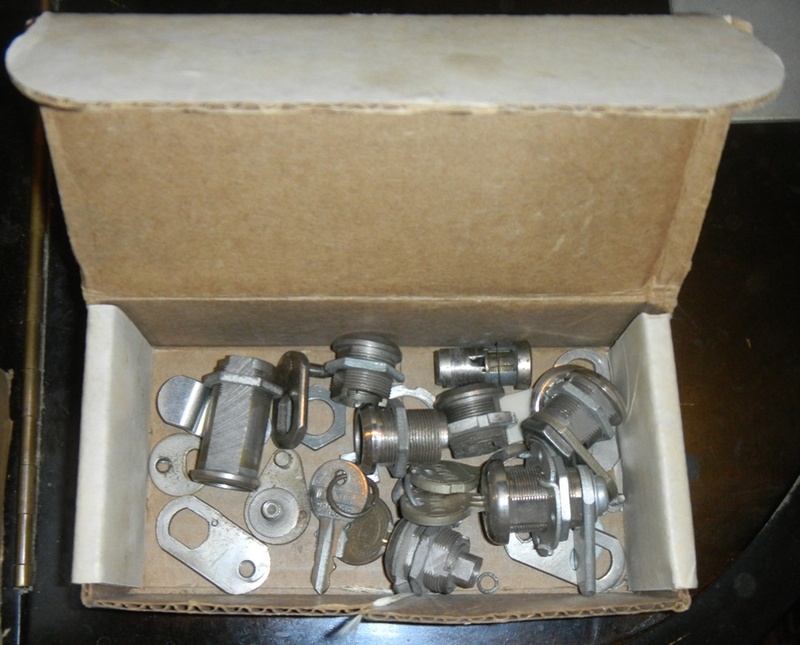 Of little value, but you may find these parts useful. 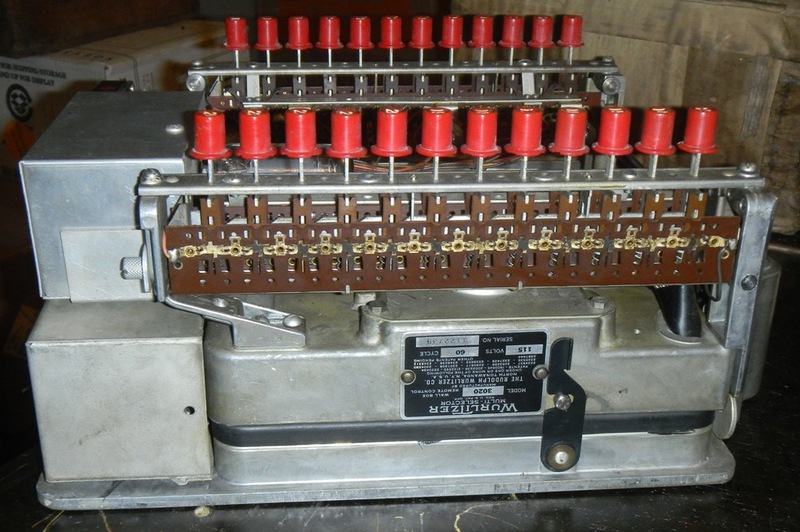 The ten fuse holders are NOS and identical to the ones Wurlitzer used back in the 1940's. 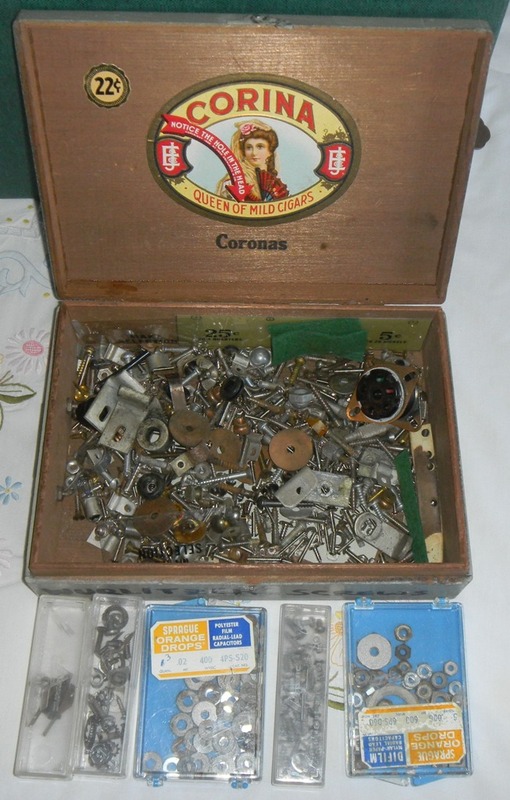 The cigar box full of washers, screws, etc. 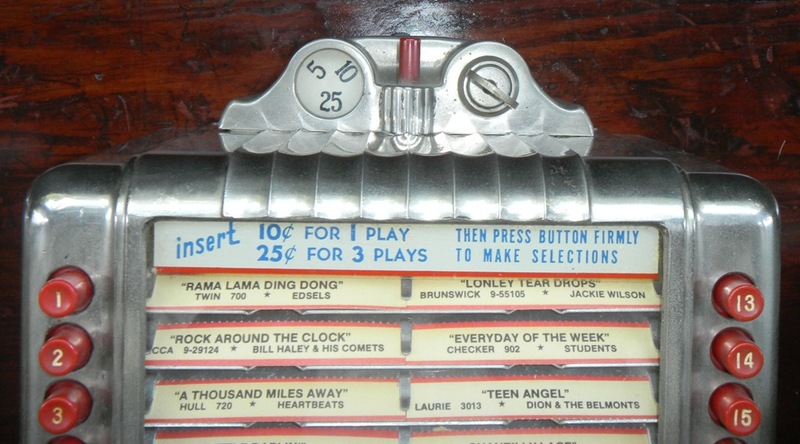 is mostly stuff from original Wurlitzer 24-play jukeboxes. 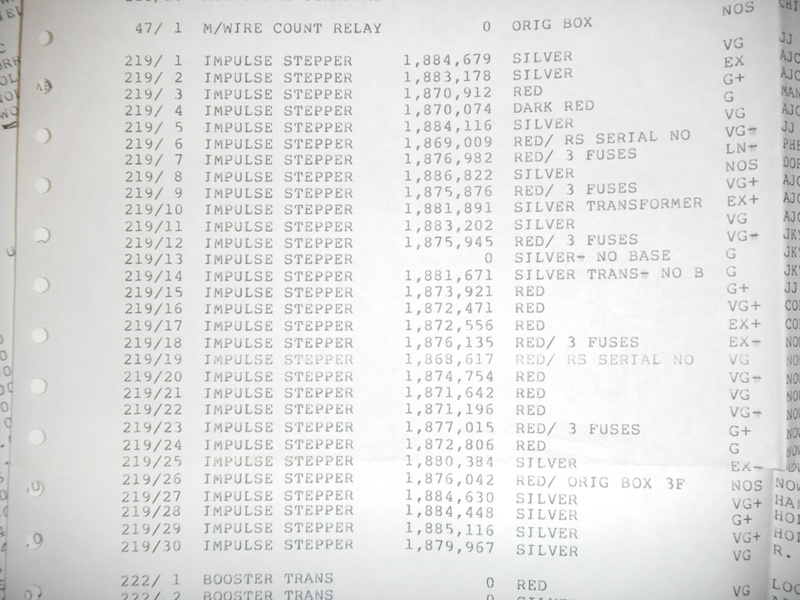 I kept a detailed inventory on the Bank's mainframe computer. Remember those wide chain printers? Add up what you think this entire pile is worth? If you have Excel or compatible spreadsheet software on your PC, click her >> Excel file where you can quickly add things up.